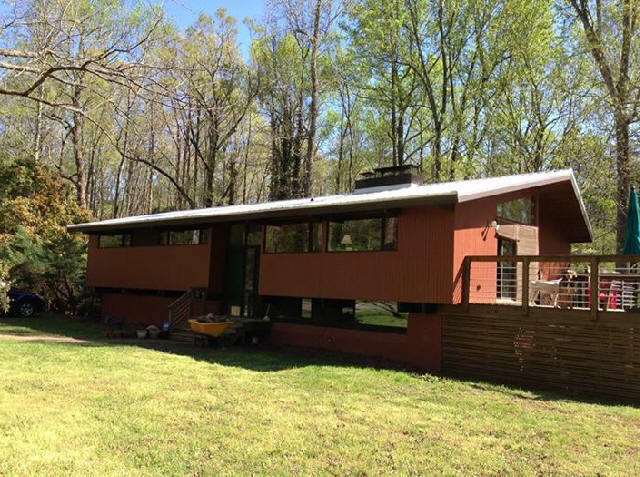 Deck House was founded in 1959 by William Berkes and Robert Brownell who worked as young men for Carl Koch building prefab Techbuilt houses. 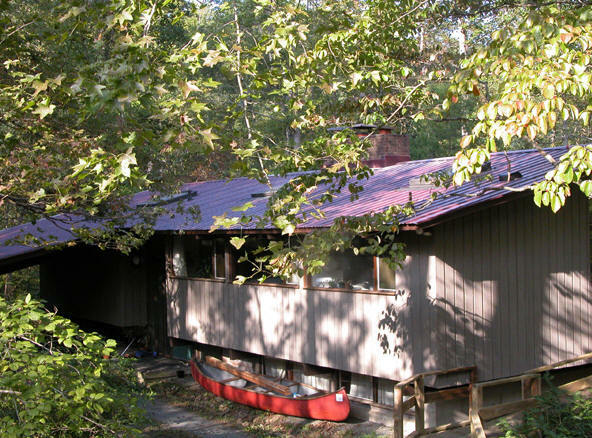 Unlike Koch’s earlier modular houses, built mostly with mass-produced materials such as aluminum and linoleum, Deck House introduced natural woods and stones such as mahogany and slate. 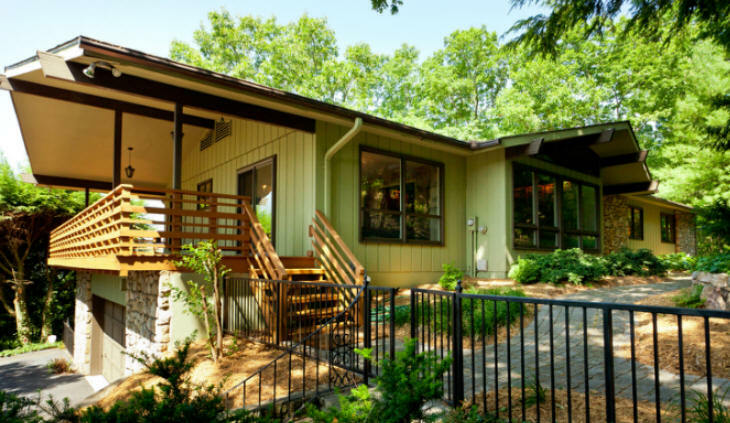 Deck Houses feature post and beam construction, tongue and groove vaulted ceilings, and sliding glass doors leading out to a deck. 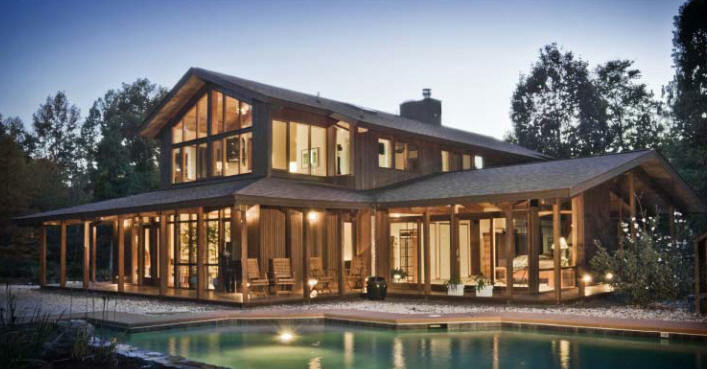 Over the years, Deck House and its successor companies have designed or built more than 20,000 houses around the world. 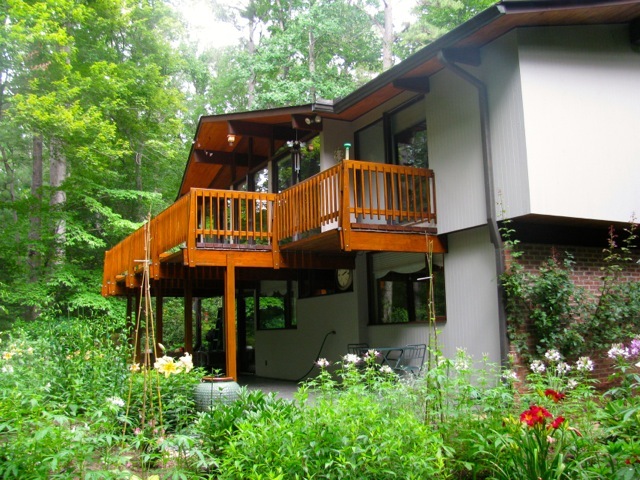 In 1995, Deck House merged with Acorn Structures, founded in 1947. The firm was renamed Empyrean International in 2005. In 2008, Empyrean closed and a court-ordered receiver took control of the company. 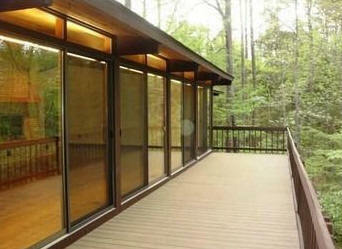 However, by 2009, the firm reorganized and Deck House was back in business under the Acorn banner. 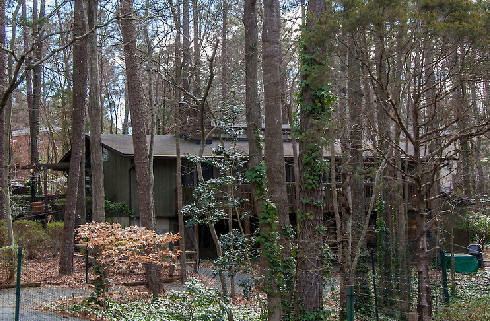 Most mid-20th-century Triangle-area Deck houses were built by two firms: C. S. Witt of Durham; and Bomar Construction Company of Chapel Hill, co-owned by Robert (Bob) Bacon and Maurice Pridgen. Year Unknown - The Witt House, 3403 Old NC 10, Hillsborough NC. 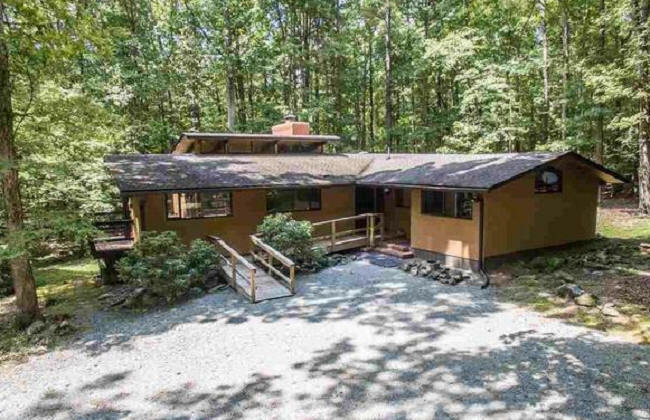 It's unlikely this 1948 structure started out as a Deck House, but there are reports it ended up as one through renovation, possibly through C. S. Witt, but all this needs verification. 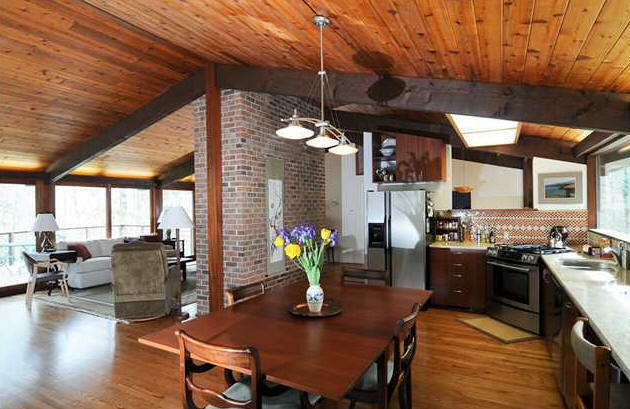 Heated floors, exposed beams, commercial kitchen. 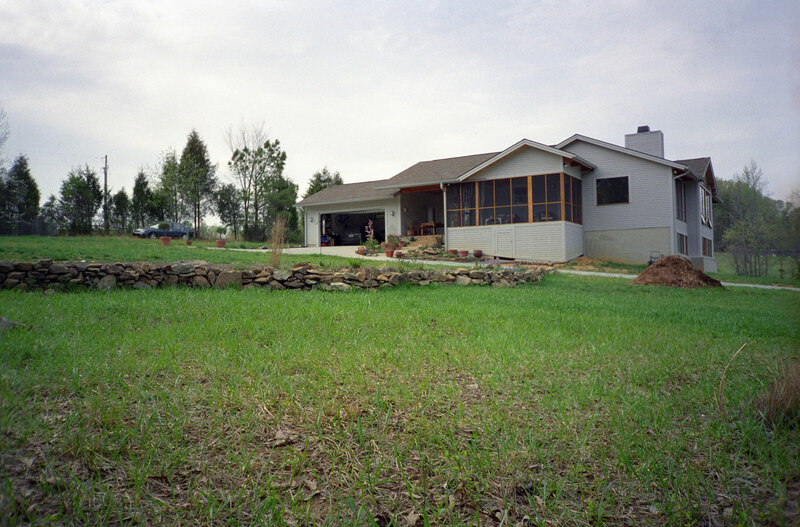 As of the late 1990's the house on the property had been destroyed. Deeded to Daria Witt. 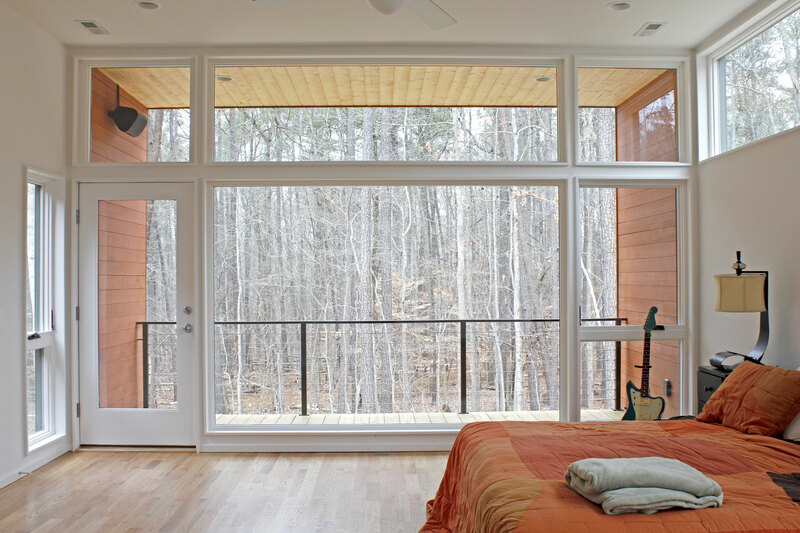 Deeded to the Triangle Land Conservancy. 1965 - The Betty J. and O.K. 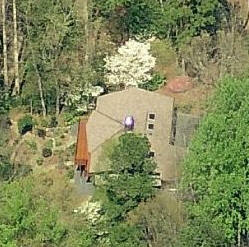 Webb Jr. House, 849 Stadium Drive, Boone, NC. 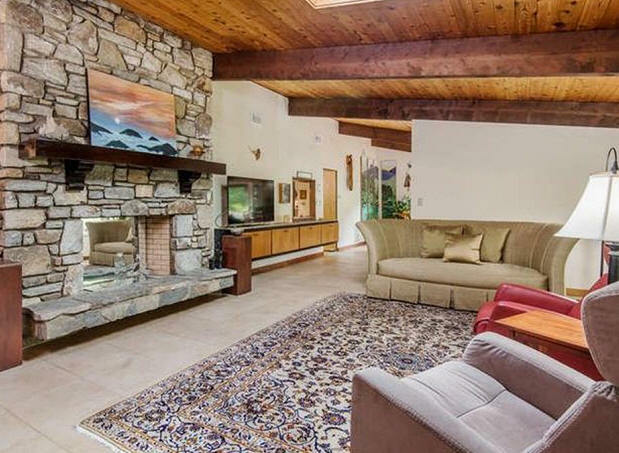 Sold in 2018 by the Betty J. Webb Life Estate to the Polly Pergason Living Trust. 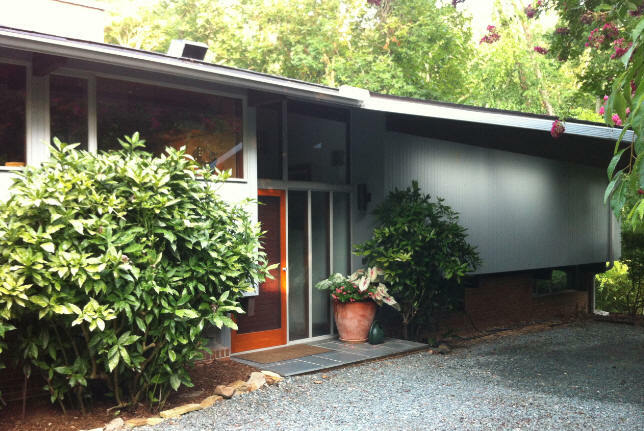 1966 - The Robert and Joann Claytor Residence, 1646 Marion Avenue, Durham. Built by C. S. Witt from a modified version of Model "757 reversed" dated September 1, 1966. 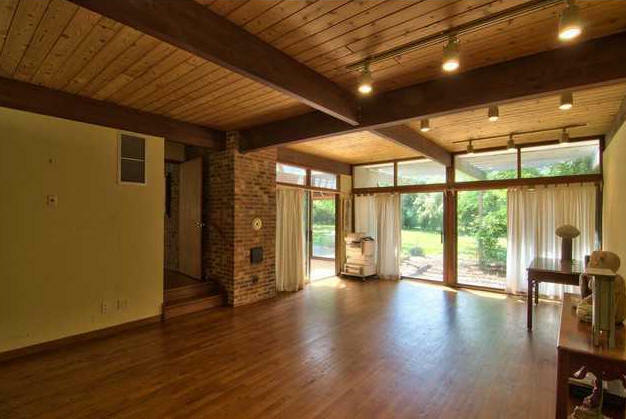 Sold in 1968 to Henry and Lou A. Hellmers who added a garage. 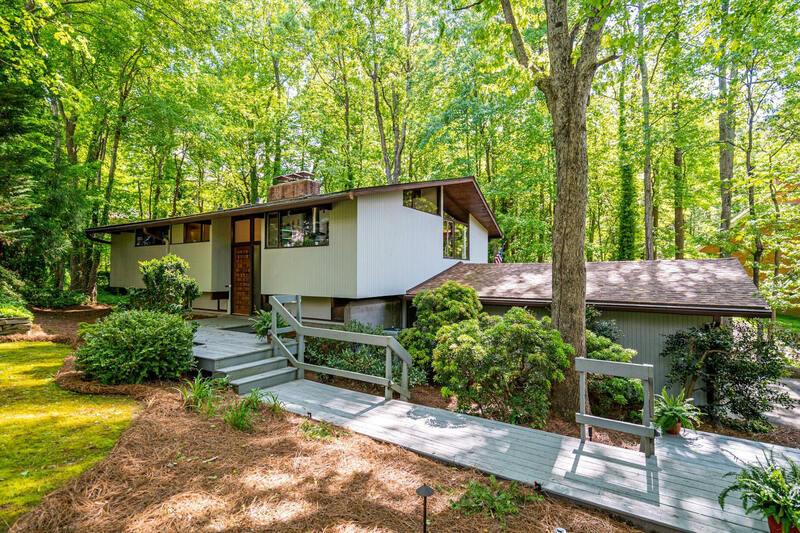 Sold to Dennis Baltzley who did a complete interior renovation. 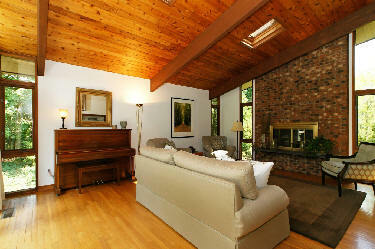 Sold in 2010 to So Young Kim and Jorn Coers. 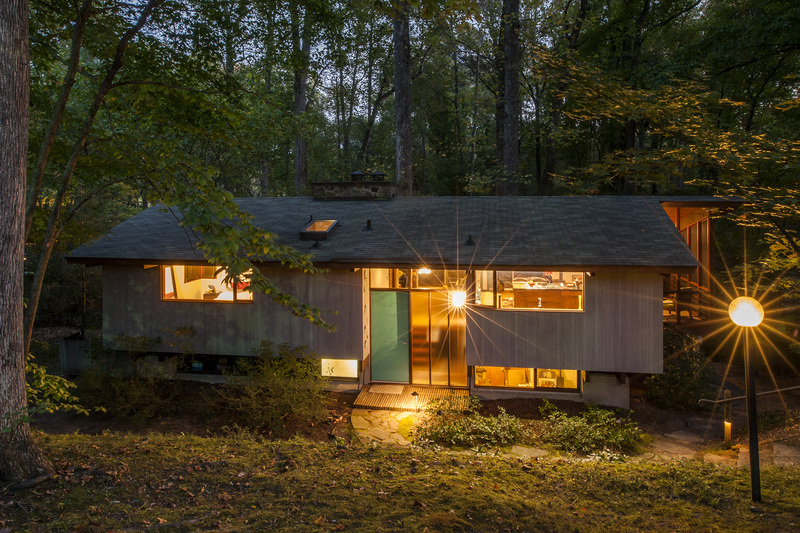 1966 - The Mary and Charles Horres, Jr. House, 615 Rock Creek Road, Chapel Hill. 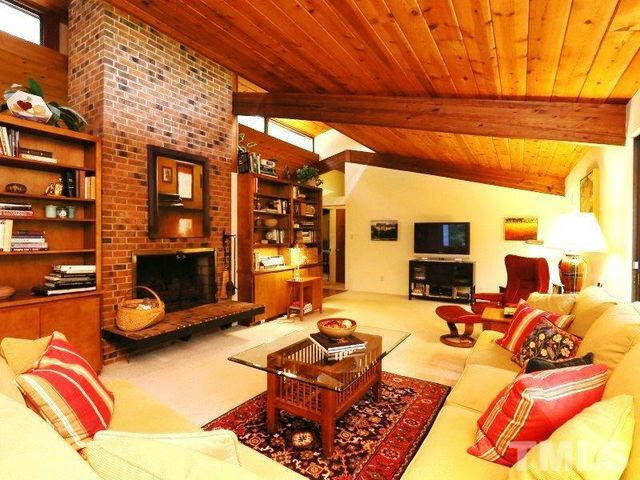 Sold 1983 to Marilou and John R. Andrews Jr. Sold in 1988 to Kathleen C. and Alan Ray Light and John. Sold in 2002 to Anna Blair. 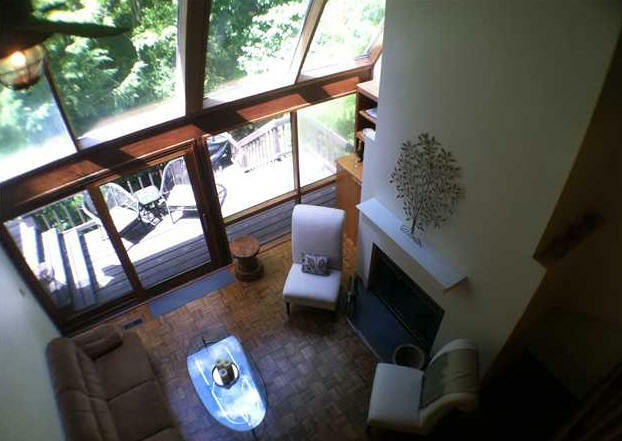 Sold in 2010 to Scott Burian and Elizabeth Harris. 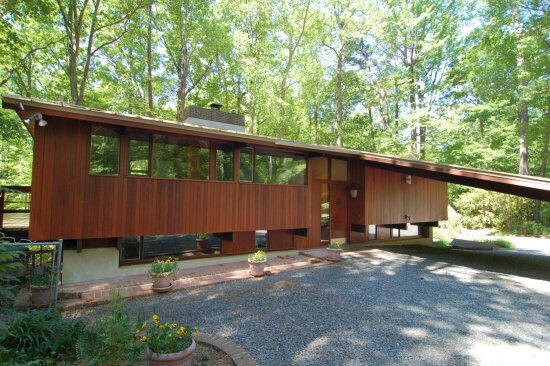 1967 - The Robert and Nancy Spaulding House, 1516 Woodburn Road, Durham. 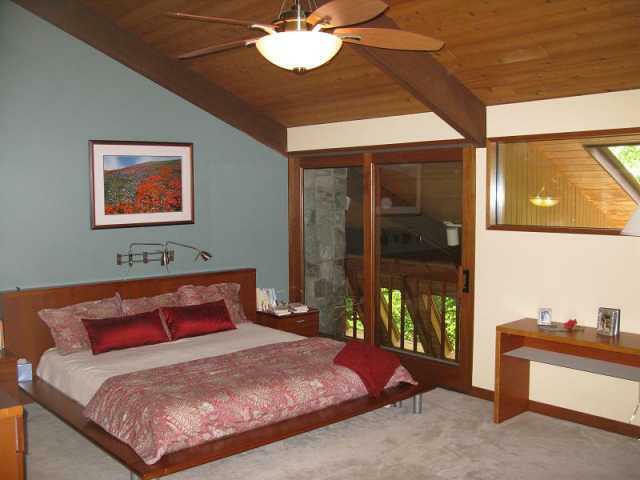 Sold to Sheila Collins and William Wetsel. 1967 - 1116 Sourwood Circle, Chapel Hill. Sold to Louis D. Roberts. 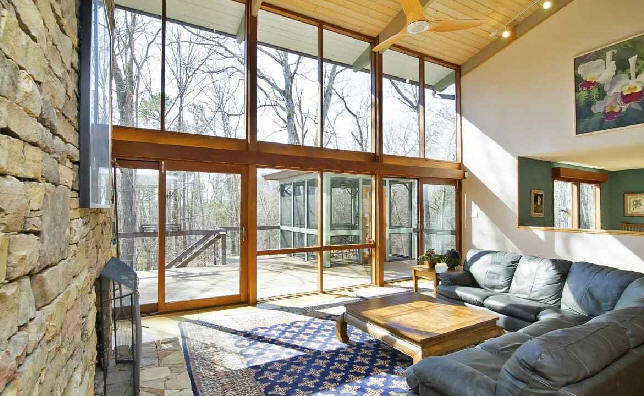 Sold in 1998 to David M. Parker and Robert Huls. Photo by Duffy Healey. 1968 - 1799 Crawford Dairy Road, Chapel Hill. Sold to George and Mildred Utsman. Sold to Bobby Lee Utsman. Went through foreclosure in 1997. Sold in 1998 to J&J Associates. 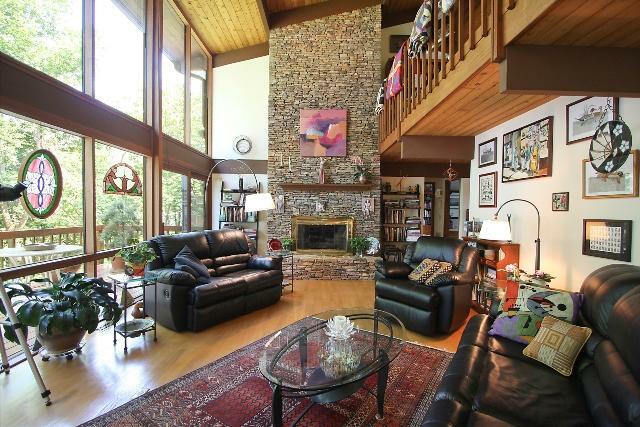 Sold in 1999 to Patricia and James Sanford. 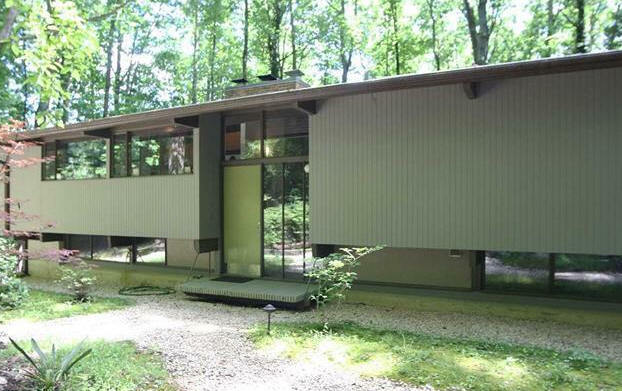 Sold in 2003 to Elliott Cramer. Photo by Duffy Healey. 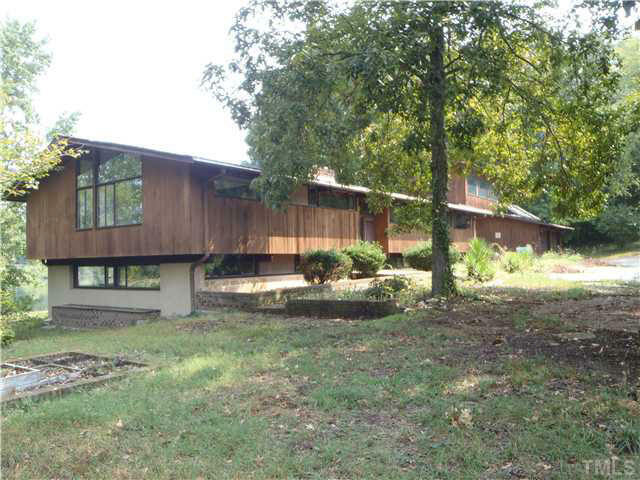 1968 - The Marcel and Joan Tetel House, 1804 Woodburn Road, Durham. 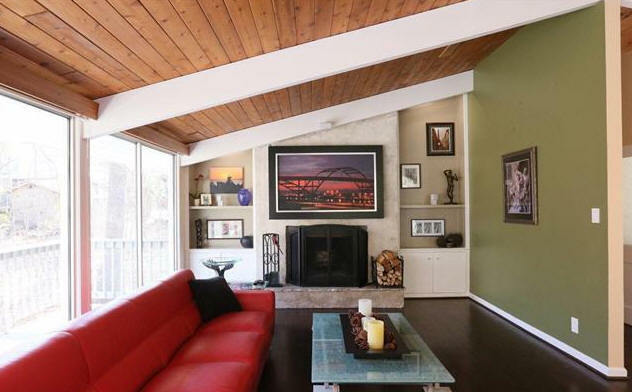 Sold to William C. and Anita Hall. 1969 - The Bernard and Pauline Silberman House, 14 Heath Place, Durham. 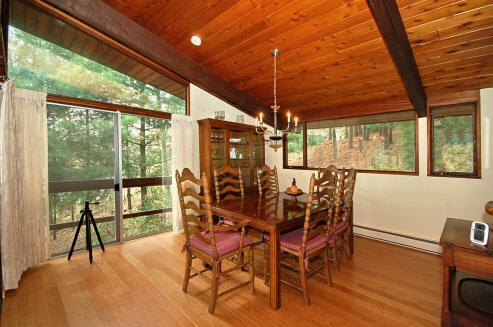 Sold in 1972 to Michael and Lise Wallach who still owned it as of 2012. 1969 - 25 Scott Place, Durham. Sold to Harris C. Sondak. 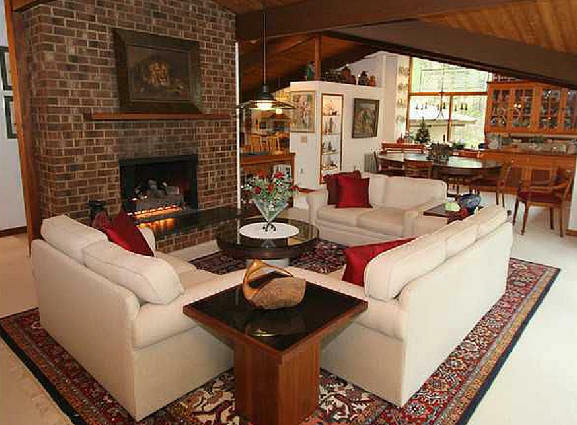 Sold in 1995 to Jack N. and Patricia Thornton, who transferred it to a trust in 1999. 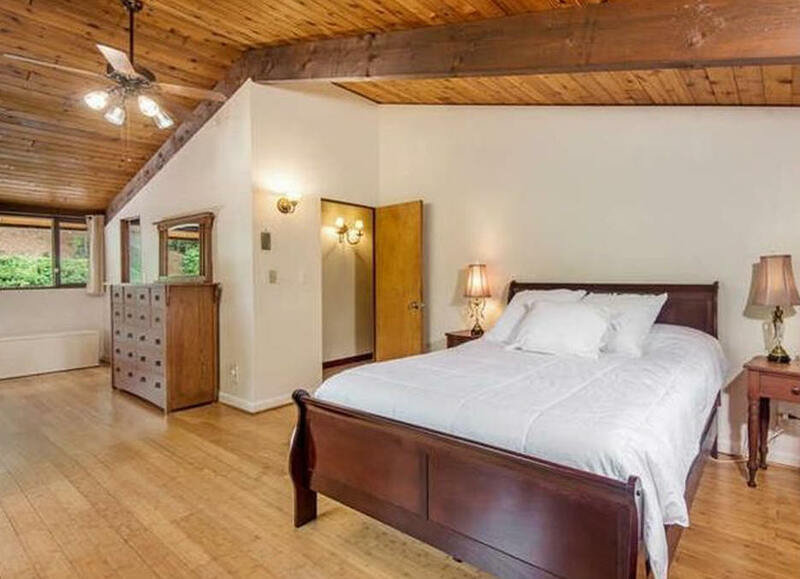 Was a rental house until sold in 2015 to Virginia and Scott O'Brien. 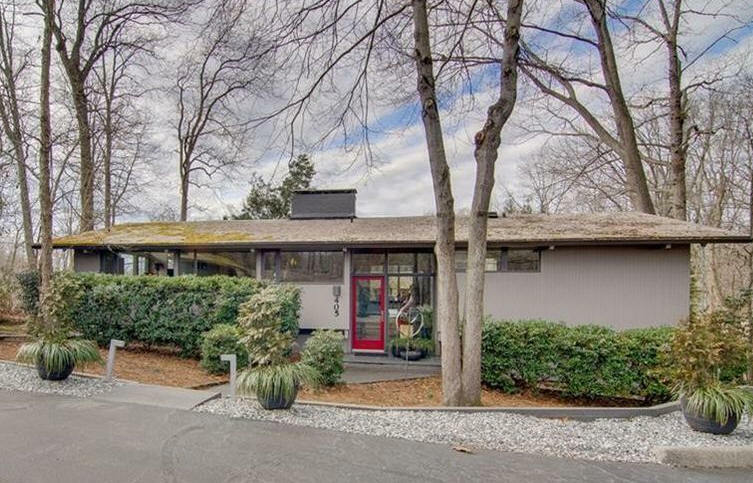 1969 - The Richard B. and Rachel Z. Booth Residence, 1817 Woodburn Road, Durham. 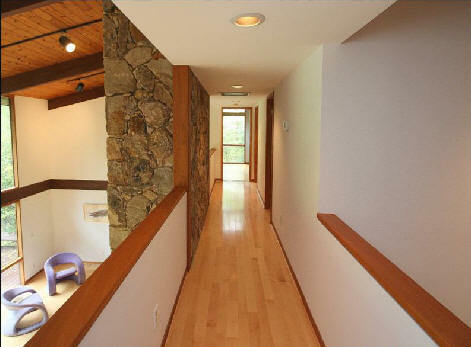 3868 square feet. Model "757 reversed" dated 1 Sept, 1966, revised 7-24-68. 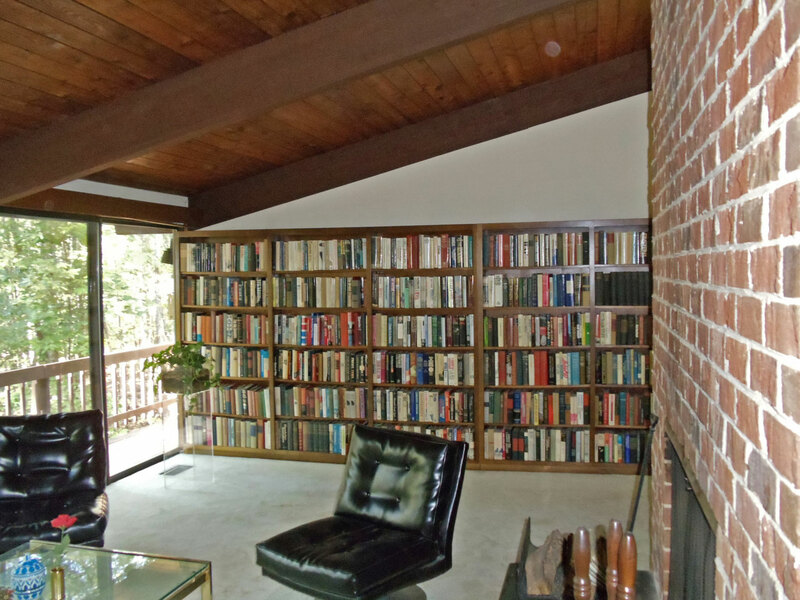 Sold in 1987 to James D. and Lynne M. Skinner. 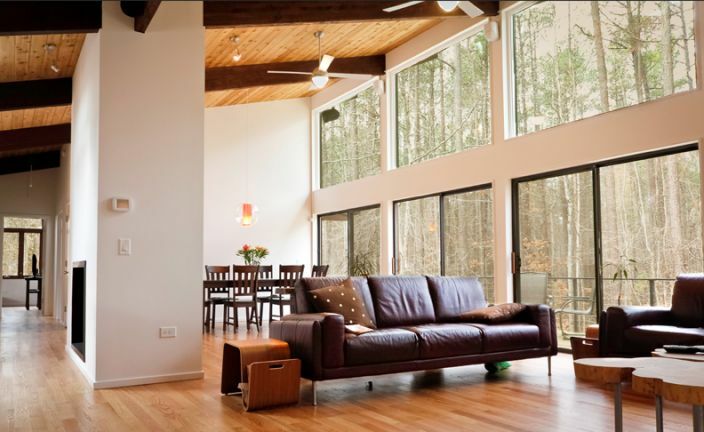 Sold in 2002 to Peter and Caelan Klein. Sold in 2007 to John H. Taylor and Laurie A. Braun. 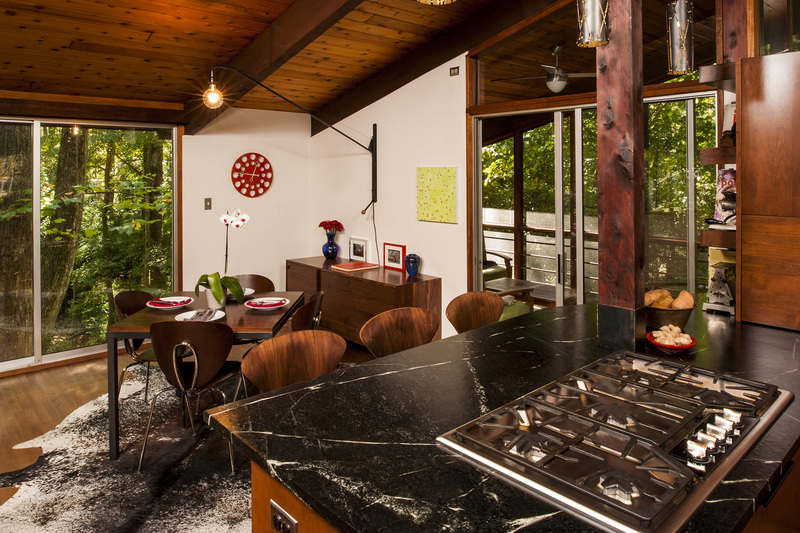 Remodeled in 2009 by Bill Waddell. Part of the 2014 Preservation Durham/NCMH Duke Forest Tour. Sold in 2018 to Isabella S. and William Anlyan. 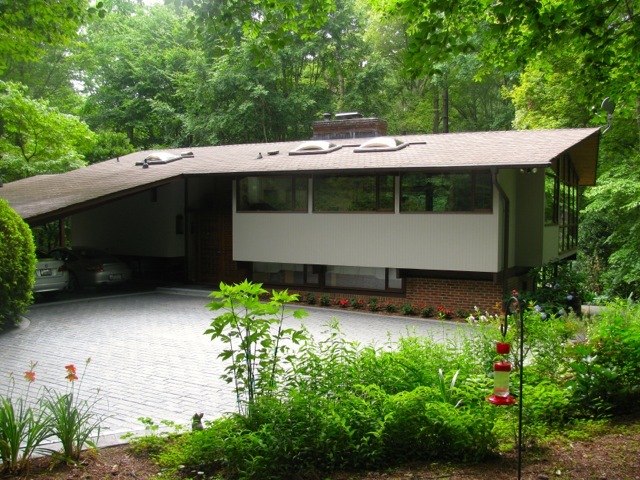 1969 - The David R. (Dave) and Lallie Godschalk House, 209 Glendale Drive, Chapel Hill. Photos by Heather Wagner, Dave Godschalk. 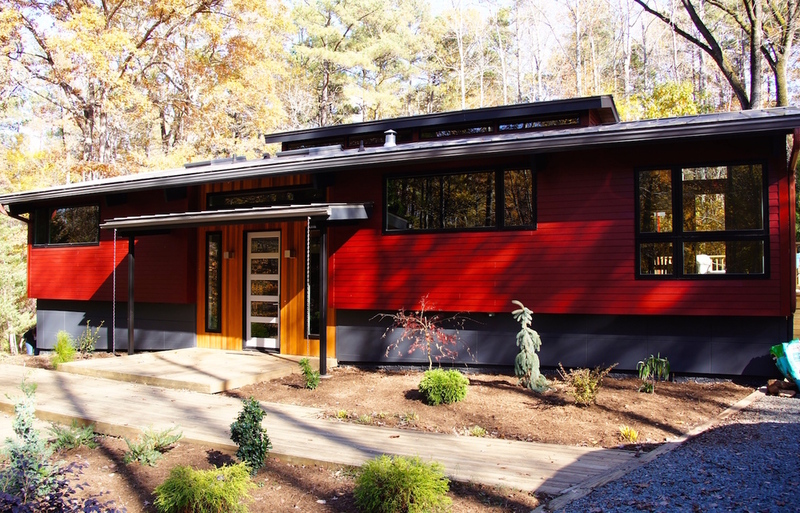 Godschalk was a professor at the UNC Planning Department and a registered FL architect. 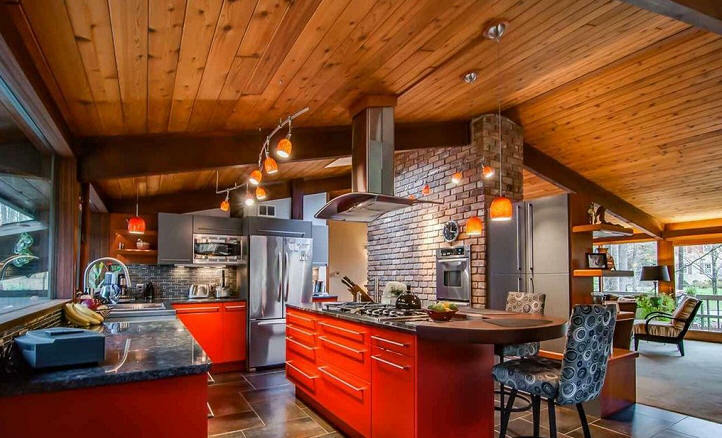 He and the builder, Robert Bacon, had it shipped from Boston on a flatbed truck and modified the kitchen, entry, and many other aspects. 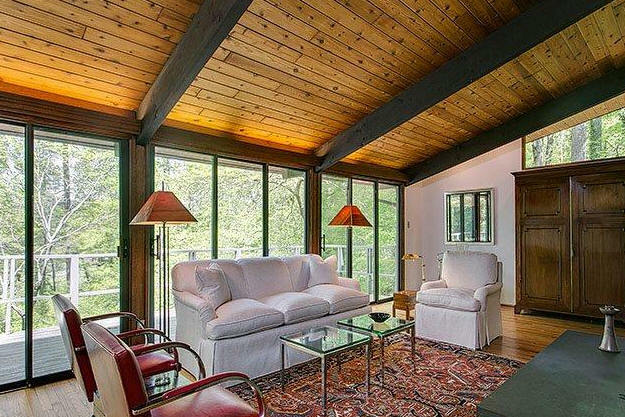 Extensive remodeling, including adding a screen porch and updating the kitchen and baths, was done by Everett Bacon, son of the original builder. Sold in 2008 to Daniel Sherman and Eduardo Douglas. 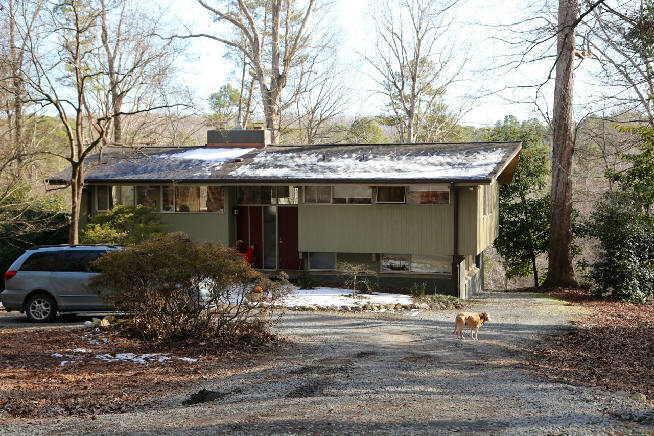 1969 - The Bessie M. and Paul D. Carrington House, 1616 Pinecrest Road, Durham. Sold in 2014 to Benjamin Lee. 1969 - 3524 Rugby Road, Durham. Other owners. Sold to David Scott Howell. Sold in 2003 to Elizabeth Applewhite. Sold in 2012 to Aaron C Gard. Photos by Trey Thomas. 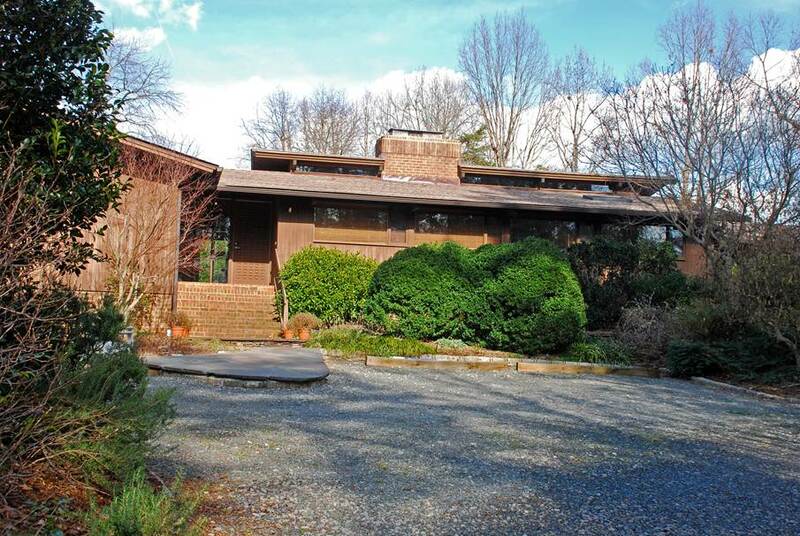 1969 - The Dan and Carol Pauk House, 1802 Woodburn Road, Durham. 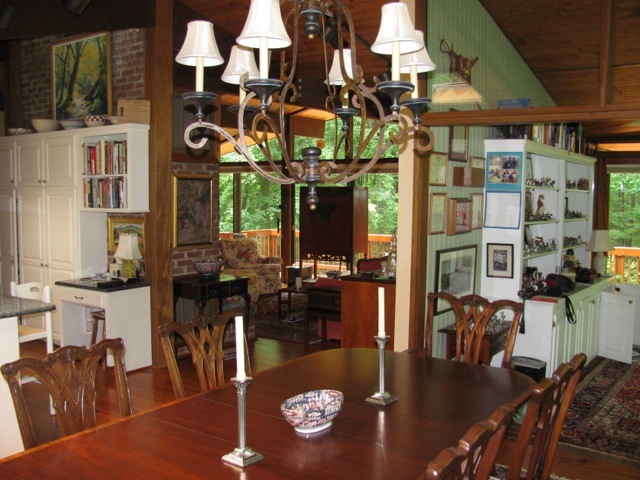 Sold in 2002 to Mary Beth Bishop and Alan Fenwick. 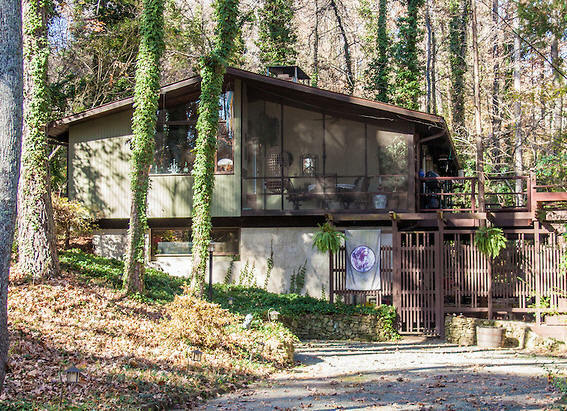 1970 - The David and Tamar Savir House, 207 Glendale, Chapel Hill. Built by Bob Bacon. 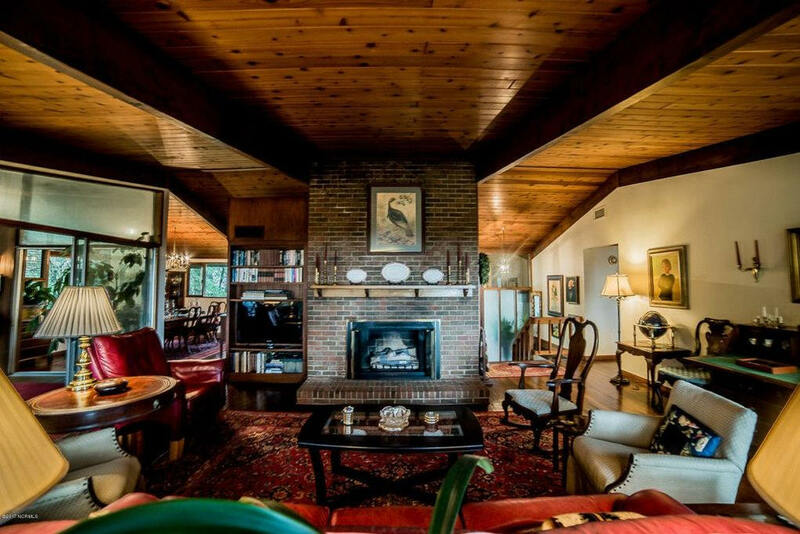 Sold in 1981 to Frederick B. and Dorothy Askin. 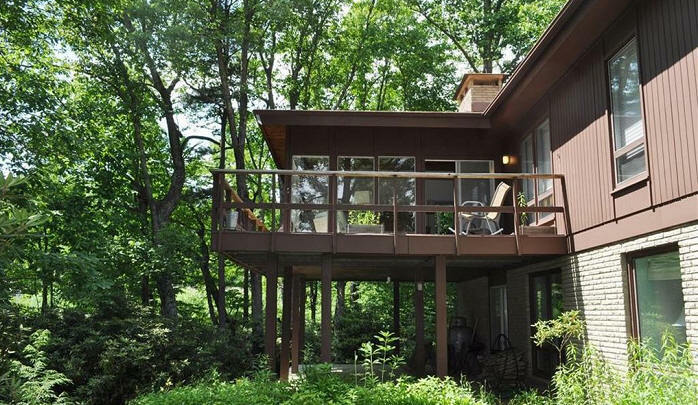 Sold in 1986 to Glenn and Diana Withrow. As of 2012 owned by a trustee for Glenn Withrow. Photo by Trey Thomas. 1970 - 725 Kenmore Road, Chapel Hill. Built by Bob Bacon. 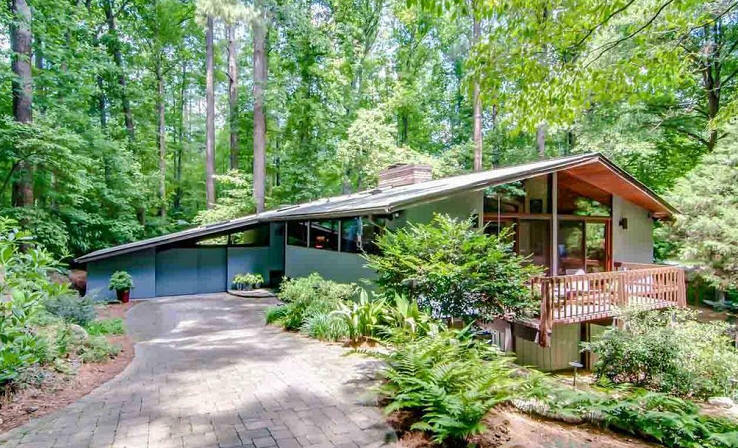 1970 - The Henry and Carol Miller House, 1301 Arboretum Drive, Chapel Hill. Sold in 1999 to Johnny Randall who still owned it as of 2012. Assembled by Bomar Construction, Robert Bacon. Top photo by Duffy Healey. 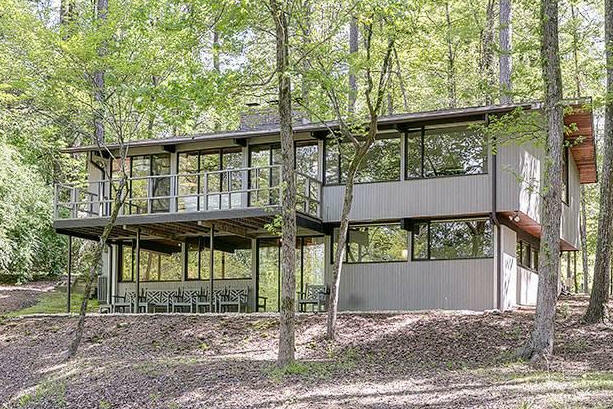 1970 - The David and Carol Eckerman House, 301 Hoot Owl Lane, Chapel Hill. 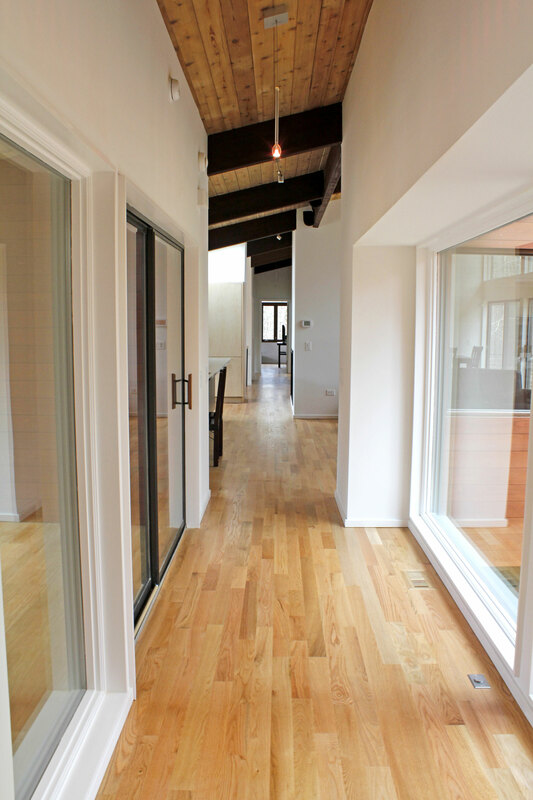 Built by Bomar Construction. 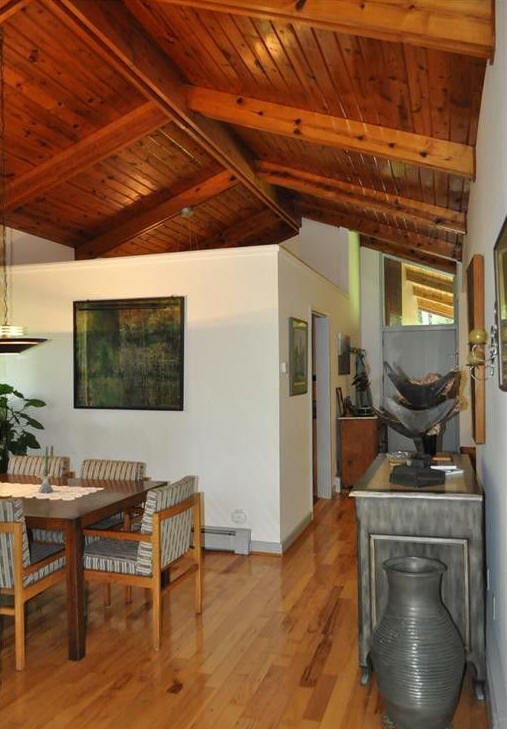 Sold in 2013 to Cathryn Rich and Darren Selement. 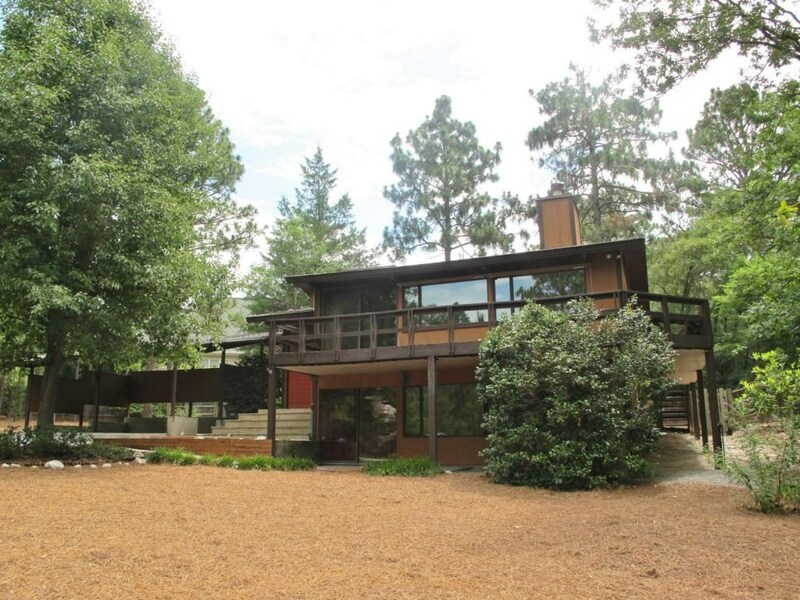 1970 - The Harry and Grace Phillips House, 1308 Arboretum Drive, Chapel Hill. 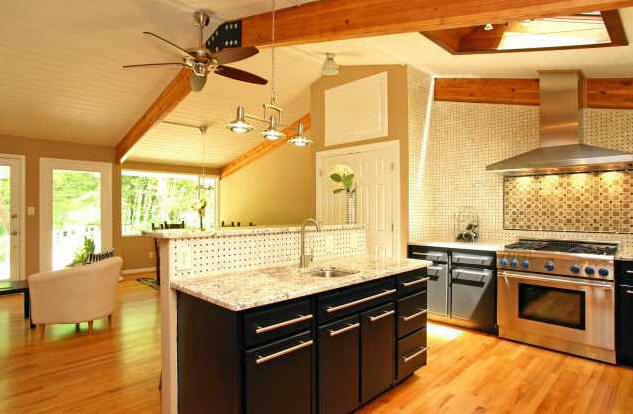 Built by Bomar Construction. 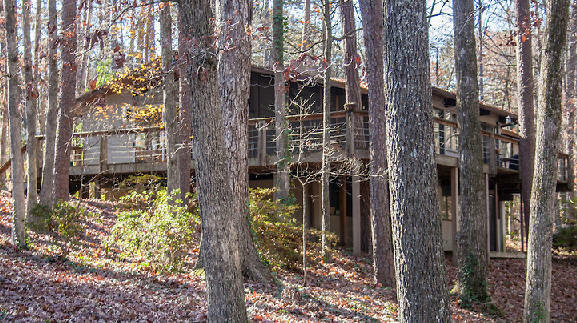 Sold in 1998 to Teresa and Dean McDaniel. 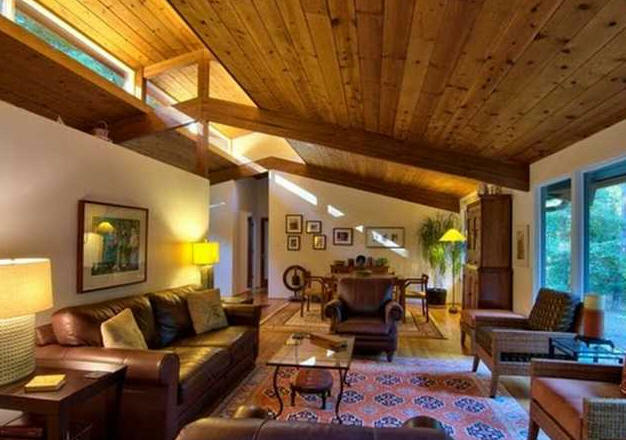 Sold in 2002 to Michael Harrigan and​ Ana C. G. Felix. 1970 - The Richard B. and Georgiana Searles House, 1800 Woodburn Road, Durham. 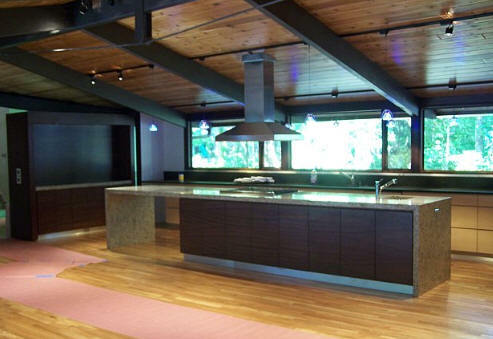 Built by Bomar Construction. As of 2014 still owned by the Searles. Photo by Duffy Healey. 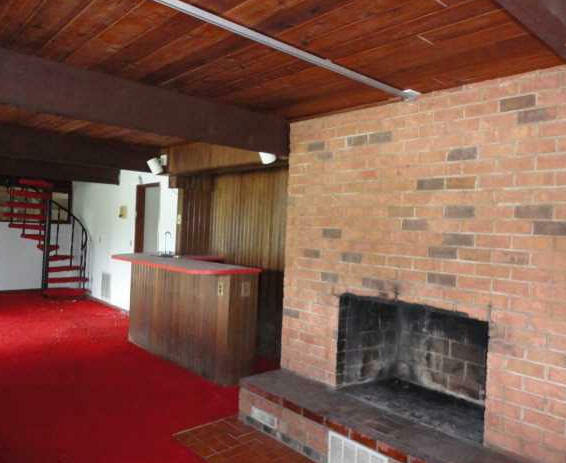 1970 - The Nancy M. and Richard C. Emmet House, aka Lucky Lounge, 5 Lucky Lane, Asheville NC. 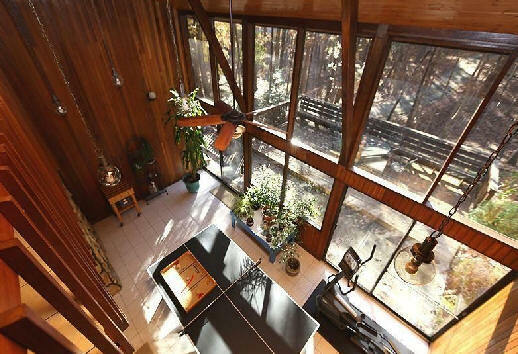 At some point in the 1980's a Deck solarium addition was put on the rear. 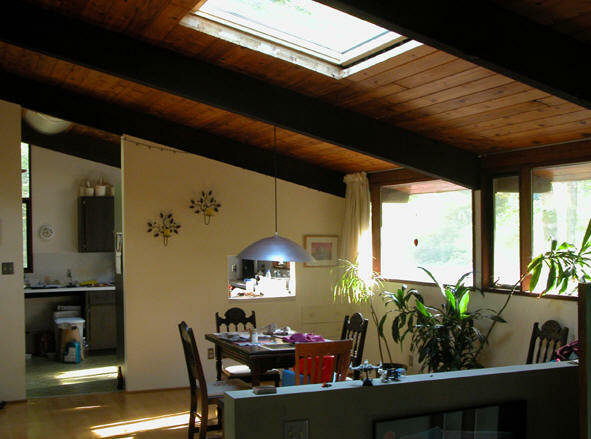 Sold in 1996 to Ria G. and Carl Aufdermarsh. Sold in 2010 to Guillermo C. Rodriguez and Jeffery B. Crawford. Sold in 2014 to Laura L. Etchen and Debra Ann Daspit. 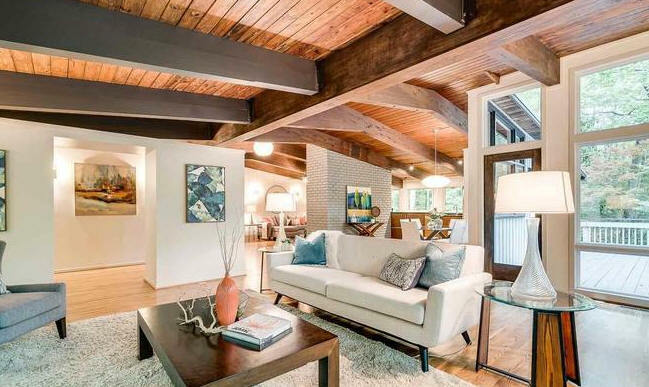 Sold in 2018 to Daryl Lynn Siegel. 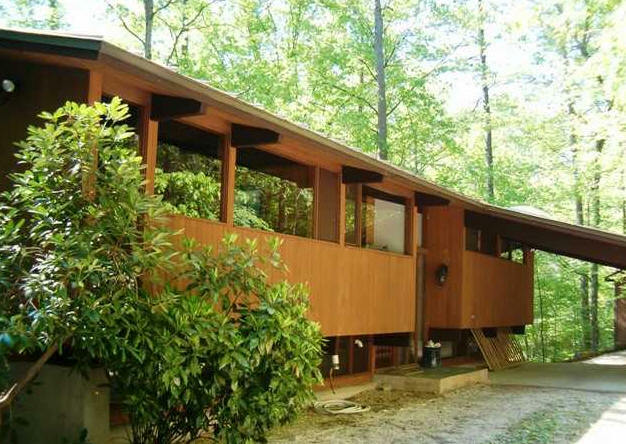 1971 - The Opie L. Shelton House, 4 Lucky Lane, Asheville NC. 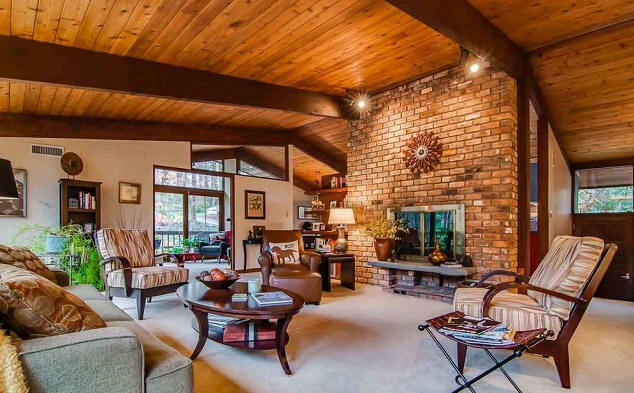 Sold in 1974 to Roger and Aline Morrison. 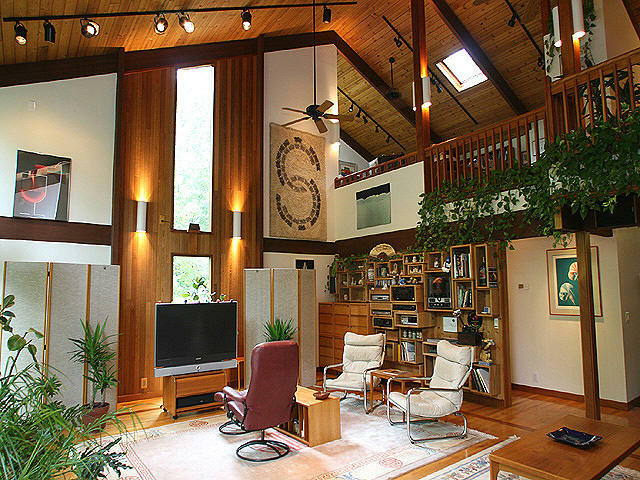 Sold in 2001 to John N. and Ann Maier. 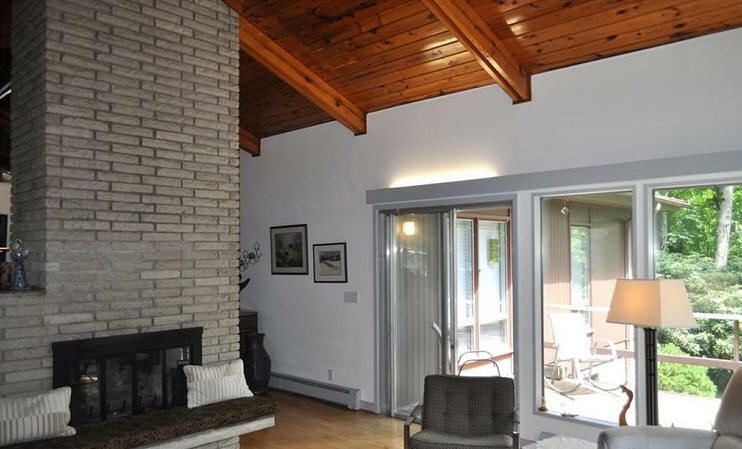 Sold in 2014 to David J. and Julia McKillen. Middle photo by Carol Miller. 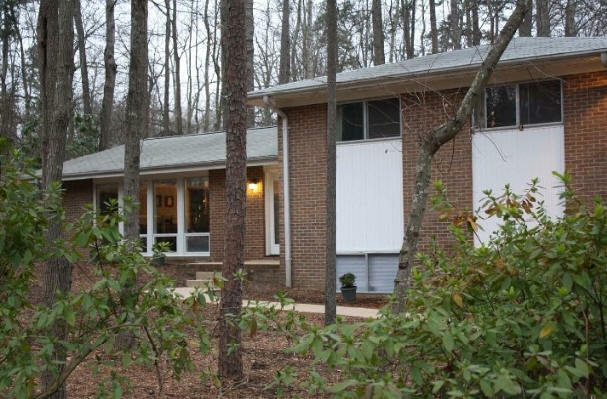 1971 - 2415 Falls Drive, Chapel Hill NC. 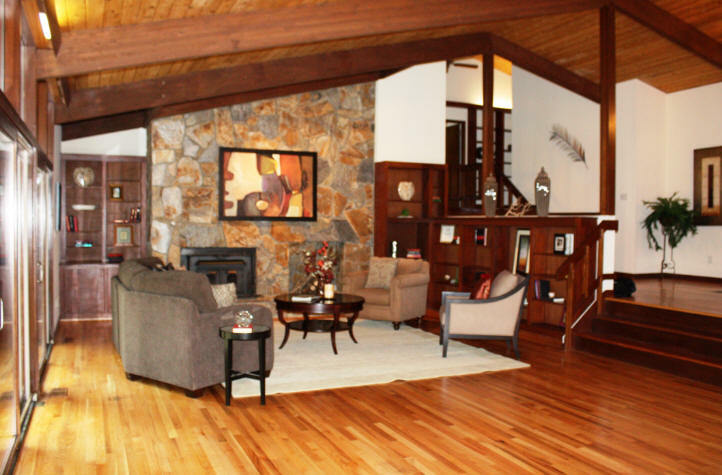 Sold to George J. and Sandra Ellis III. Sold in 1987 to Barbara H. Smith. Sold in 2016 to Crystal N. Perry. 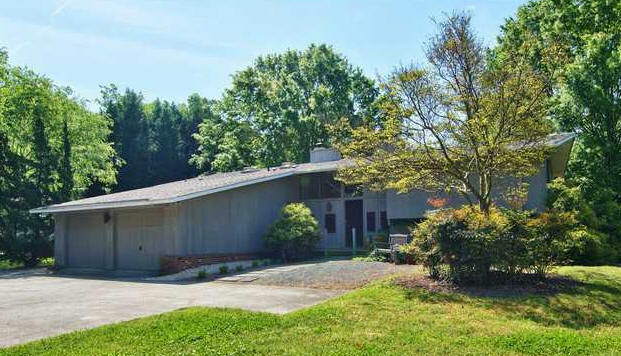 1971 - The Margaret H. and R. Frank Dalton Sr. house, 405 Cascade Drive, High Point NC. 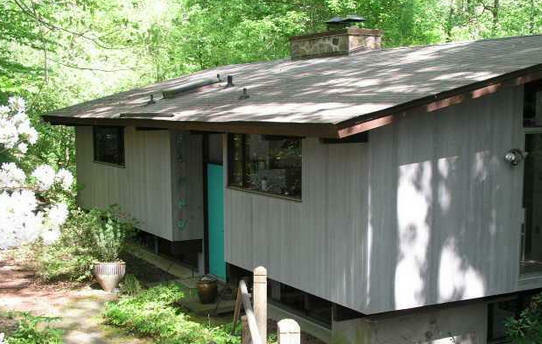 Sold in 1991 to Susan H. and William L. Gurley. 1971 - The Ruby F. and Lee W. Settle House, 1920 Dimmocks Mill Road, Hillsborough NC. 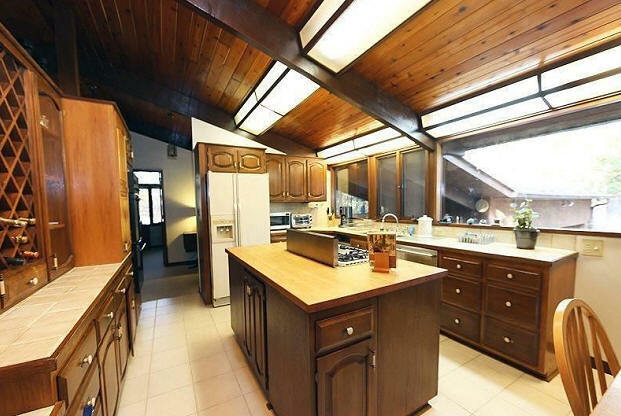 Sold in 1982 to Robert F. Steele.Sold in 1984 to Sandra B. and Robert M. Phillips.Sold in 2000 to Robert E. Ingram and Shannon V. Woolfe. Sold in 2014 to Adrienne A. Moore and Barry J. Wilson. 1971 - The James D. and Nelda G. Mold House, 4901 Whitfield Road, Durham. Sold in 2017 to Harris Lane Group LLC. 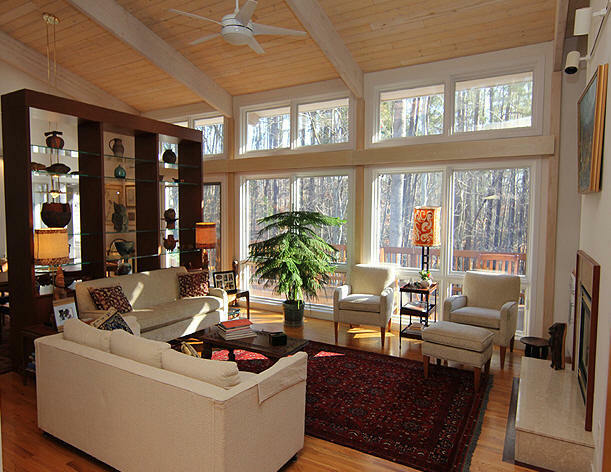 Remodeled by Bill Waddell. 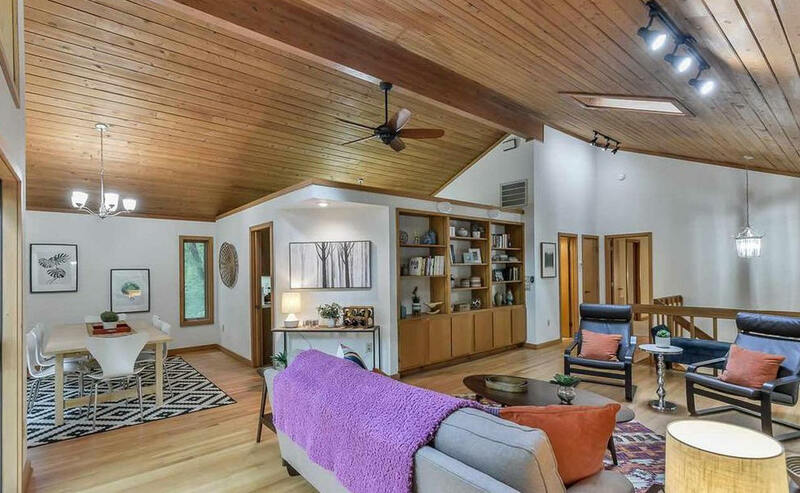 Sold in 2018 to Kathleen B. Adams and Robert J. Sudderth. 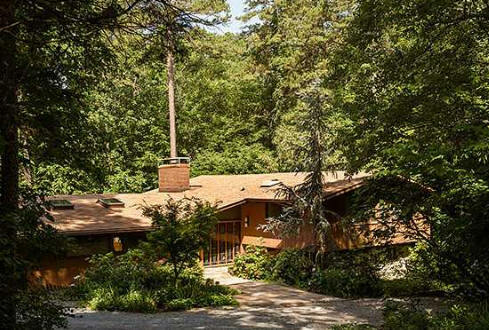 1971 - The Virginia V. and Richard M. Clifford House, 1111 Hillcrest Road, Chapel Hill. 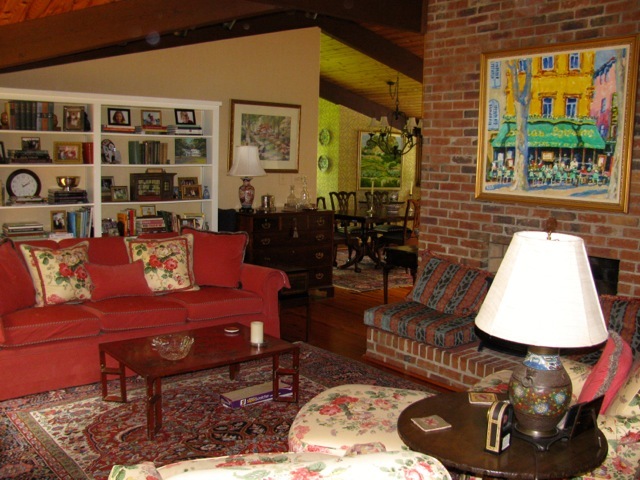 Sold in 2011 to Deborah L. and Jeffrey T. Finken. 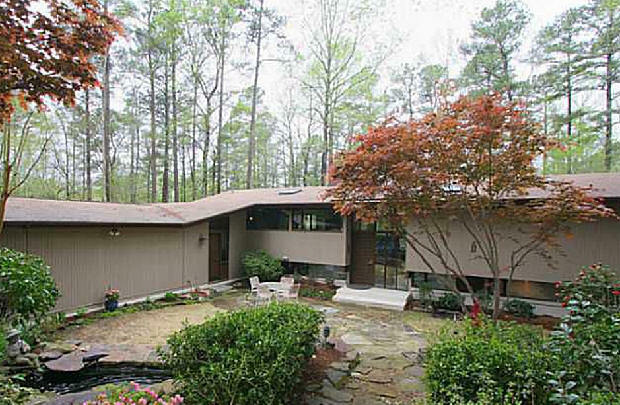 1972 - The James R. and Rebecca P. Strange House, 4204 Oak Park Road, Raleigh. The land belonged to Ligon Flynn. Built by Silas Lucas of Wilson. 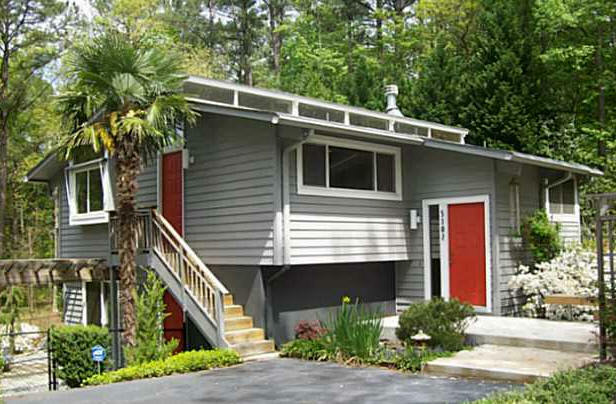 This was the first Deck house in Raleigh. 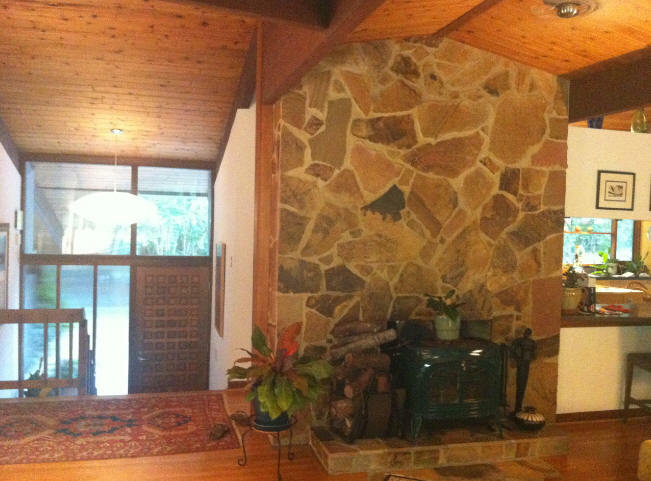 Sold in 1976 to Wayne and Joy Norman. 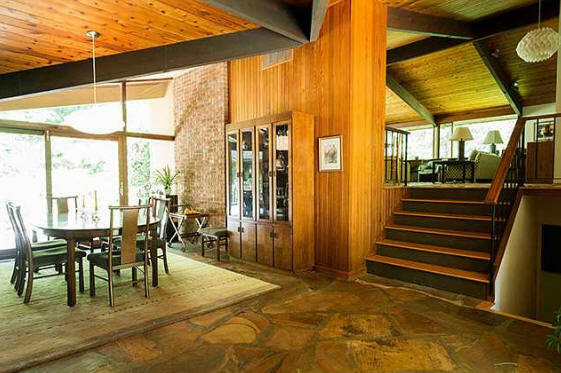 Sold in 1976 to Elizabeth Pettersen. 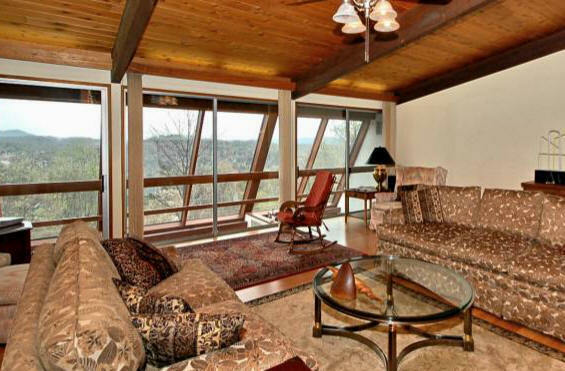 Sold in 1980 to her father, Kidd Brewer (more on him here). 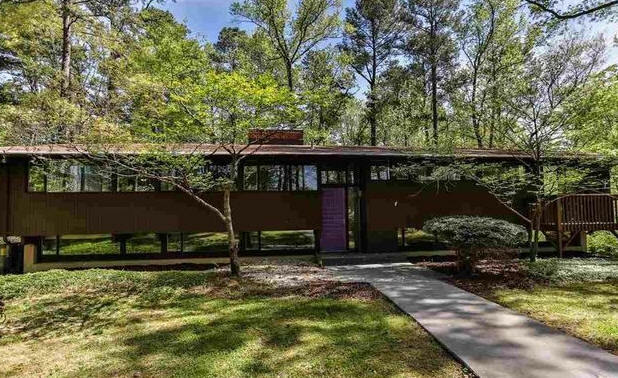 Sold in 1984 to Elizabeth Ruth Johnson. Sold in 1992 to Hunter Turnage who still owned it as of 2012. Photo by Trey Thomas. 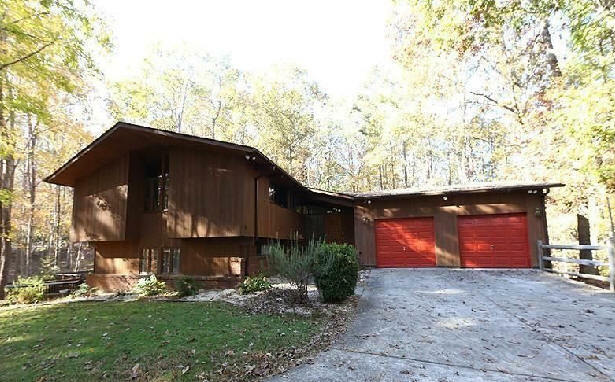 1972 - 3 Dry Ridge Road, Asheville NC. Built by Abbott Construction. 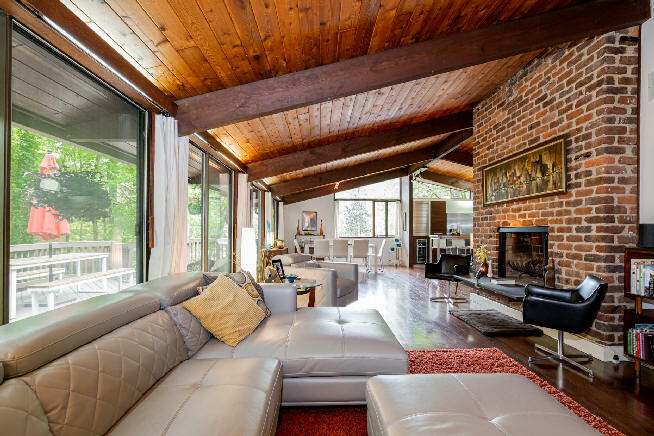 Sold in 1989 to Anthony and Maria Weisenberger.Sold in 2018 to Kelly and Chester Spinney who are doing a renovation. 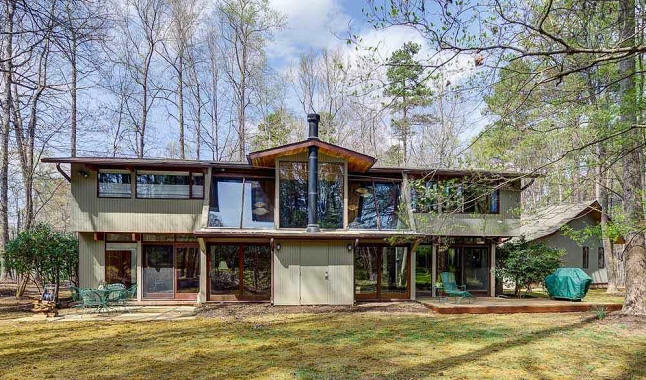 1972 - The Carole E. and Richard L. Walter House, 2818 Mcdowell Road, Durham NC. . Sold in 2007 to Robin W. and Lee C. Rogers. 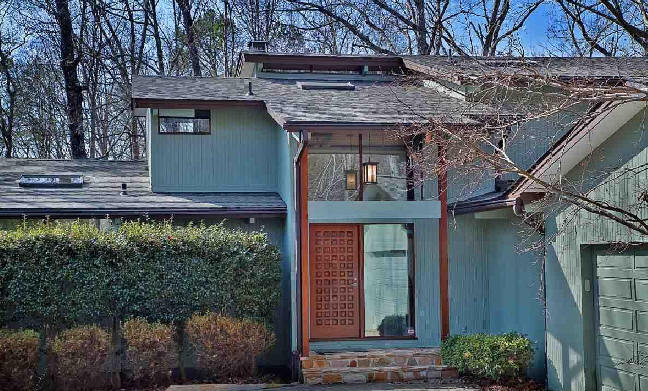 Sold in 2018 to Jennifer Chow and Jonathan Phillips. 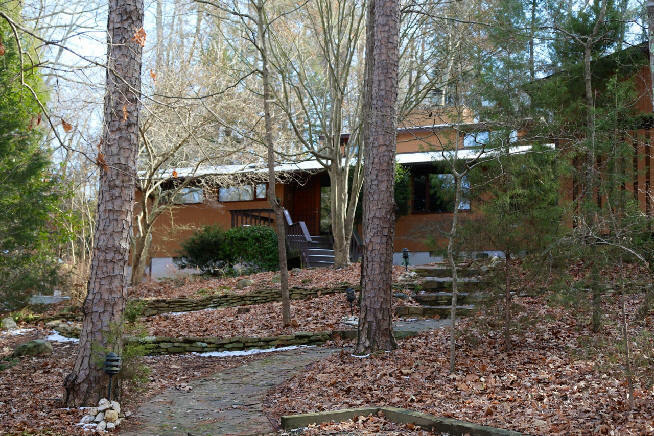 1973 - The Marvin and Ann Wync House, 1486 Poinsett Drive Lot 19, Chapel Hill. 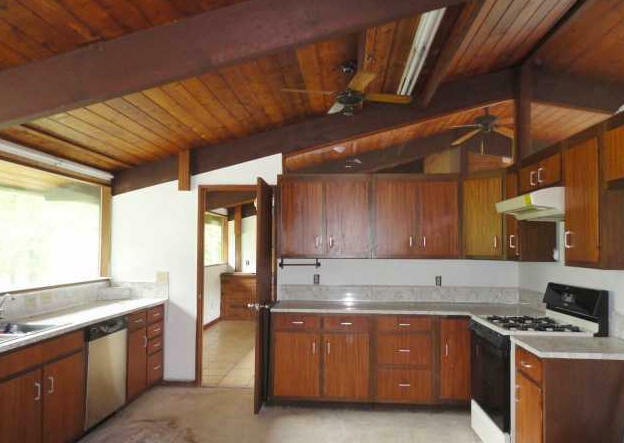 2970 sf. Assembled by Bomar Construction. 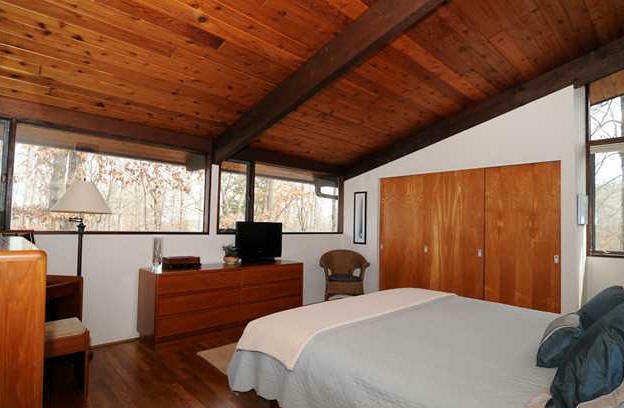 Remodeled by Bob Bacon in 1986. Photo by Leilani Carter. 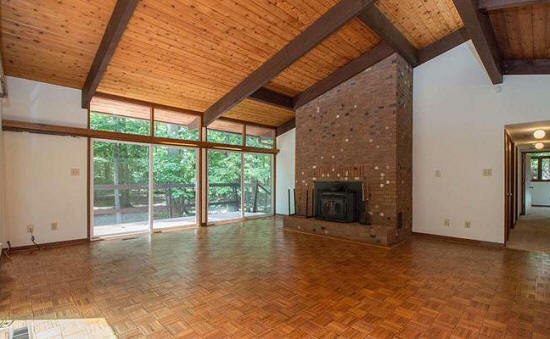 1973 - The Colin A. and Myrtle J. Palmer House, 15 Winthrop Court, Durham. 2626 sf. 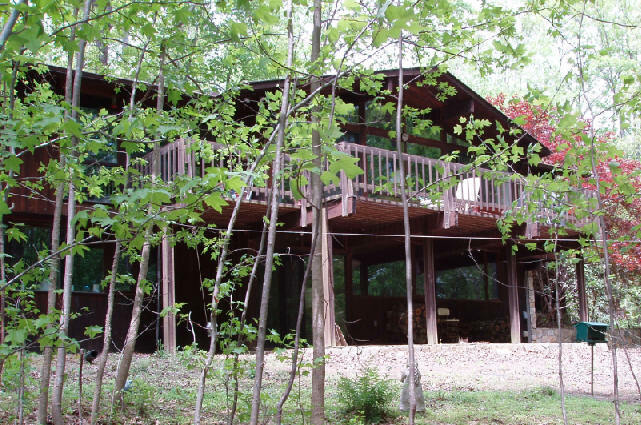 Sold in 2002 to Derek A. and Karen Hickam. 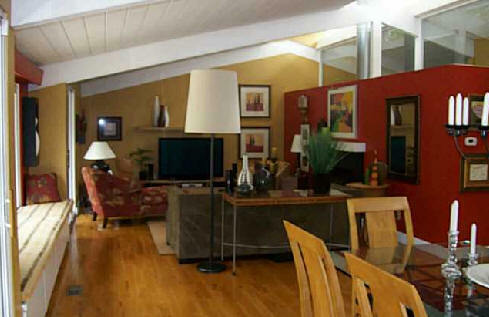 Sold in 2007 to Eric J. Christopher. Sold in 2016 to Maggie M. Cao and David C. Burnett. 1973 - The Richard and Norma White House, Pleasant Green Road, Durham. 1652 sf. 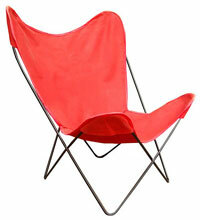 Assembled by Bomar Construction. Bottom photo by Trey Thomas. 1973 - 205 Lands End Road, Morehead City NC. For sale for the first time in 2016. 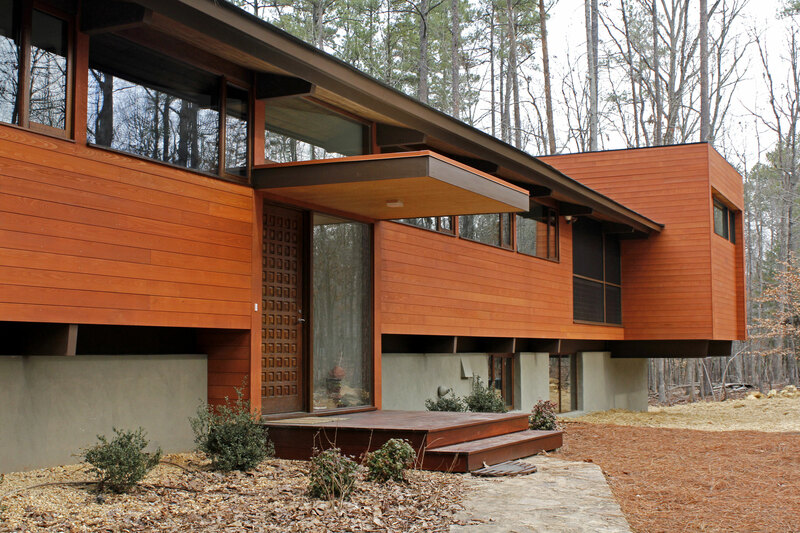 1973 - The David and Marsha Warren House, 408 Lyons Road, Chapel Hill. 2696 sf. 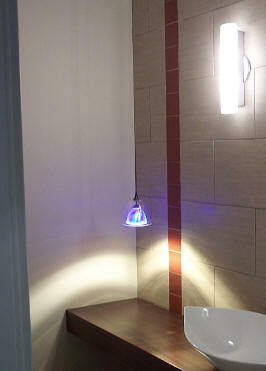 Assembled by Bomar Construction. 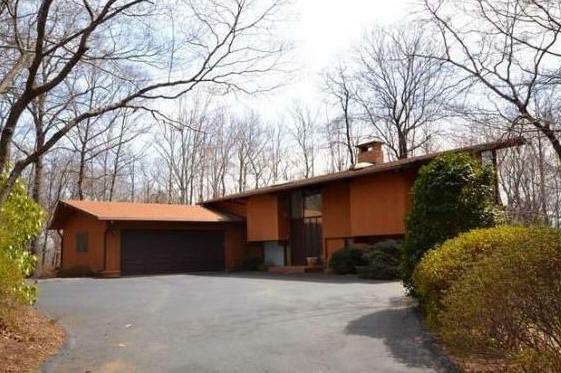 The Warrens bought a Matusmoto house and sold this one in 1987 to Rudolph Juliano. Photos by Trey Thomas. 1973 - The Peter and Margaret Bennett House, 3010 Harriman, Durham. Sold in 1985 to Ahleen Englestein. Sold to Andrew Scerbo. 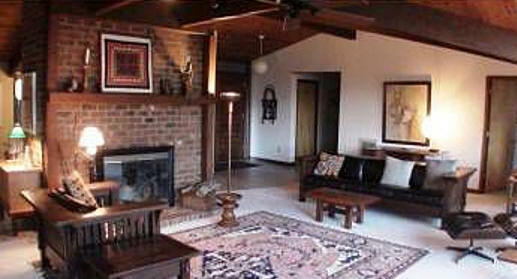 Sold in 2005 to Jeffrey and Charity H. Strang. 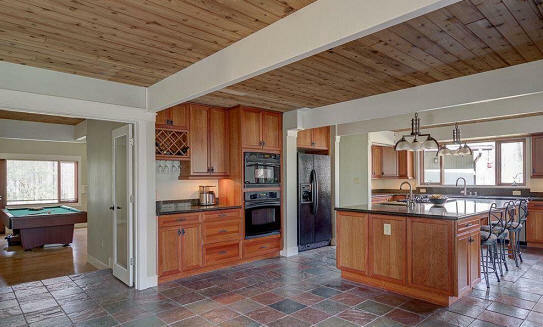 Sold in 2012 to Christina Merrill and David B. Buchwallter. 1973- 705 Ragsdale Road, Jamestown NC. 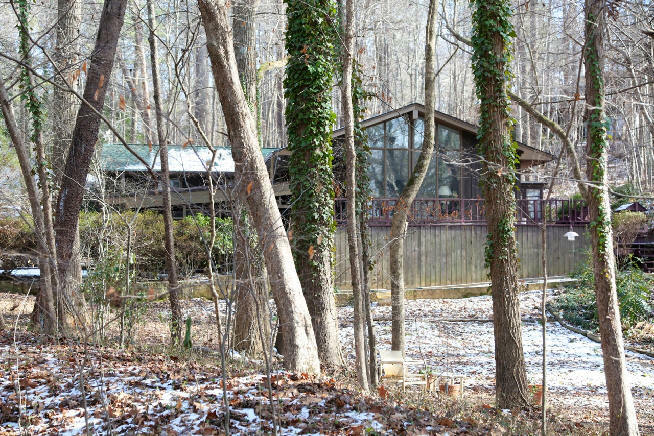 Sold in 2017 to Marty L. Jones and Connie J. Dearman. Photos by Evan Jones. 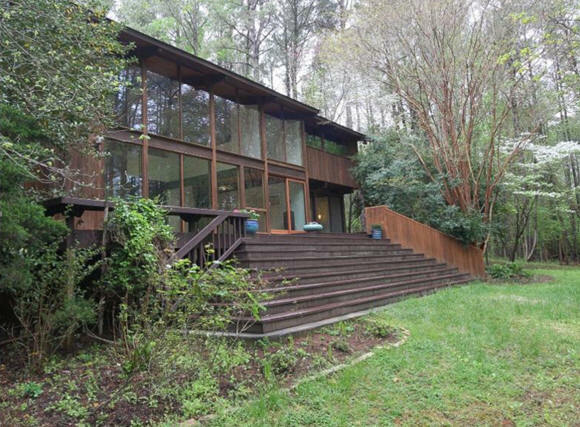 1974 - The Harold C. and Mildred F. Markham House, 4610 Hunters Ridge Trail, Durham. 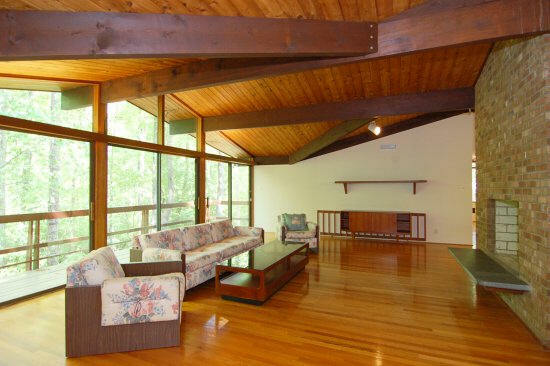 Sold in 1985 to Mary B. and David L. Raney. 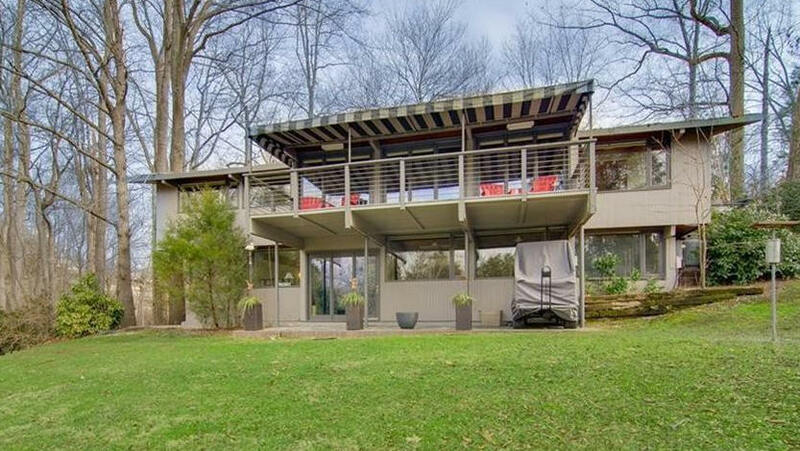 Sold in 2008 to Rosalyn B. and Dean H. Ritts. Sold in 2016 to Lenora M. and Justin M. Hunter. 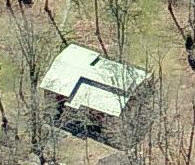 1975 - 1228 Quandary Lane, Graham NC. 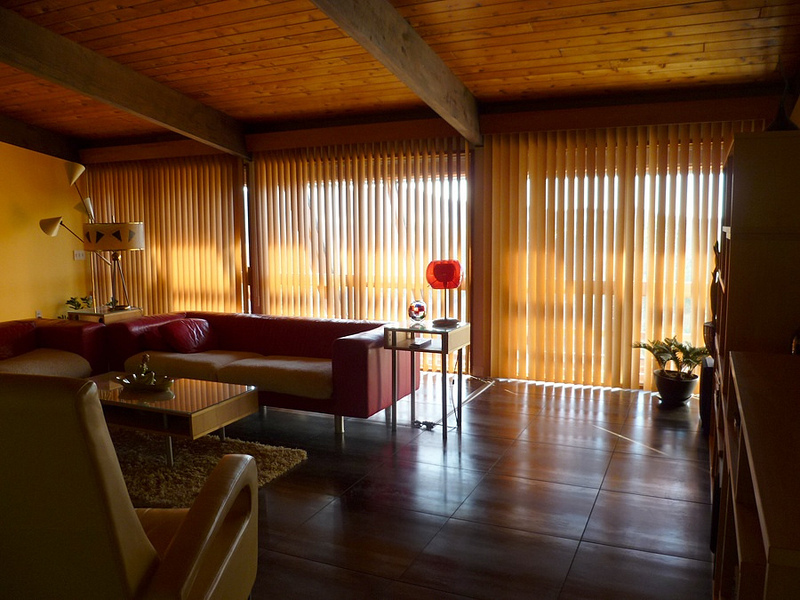 Sold in 1990 to Theodora M. and Andraos N. Nicola. Has been abandoned and vandalized for several years. 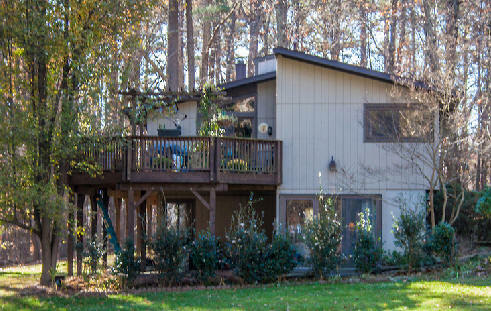 Sold in 2018 to Cynthia ans Christopher Howell. 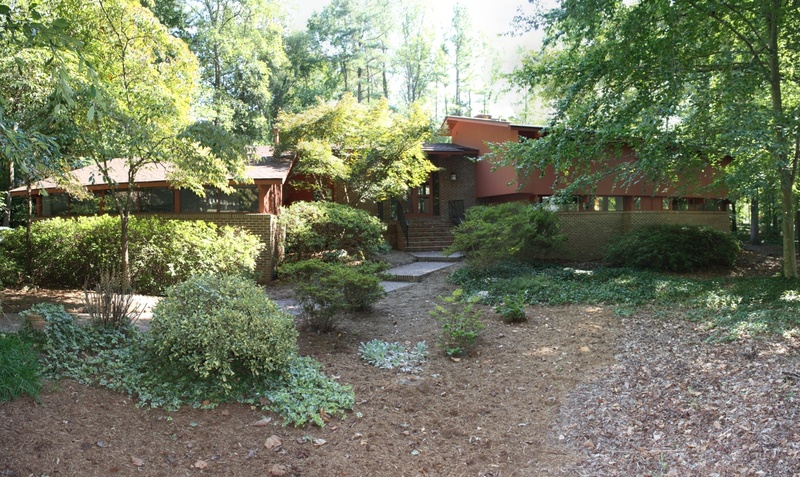 1975 - The Vladimir and Merrill Petrow Residence, 1905 Jones Ferry Road, Chapel Hill. On 28 acres. Middle photo is upper level, bottom photo is lower level. Much of the land was put into a conservation easement. Sold in 2011 to Phil Morrison. 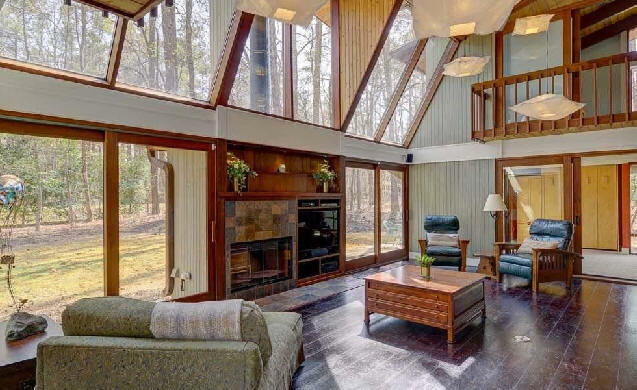 Destroyed for a new house designed by Louis Cherry. 1976 - 24 Chancery Place, Durham. 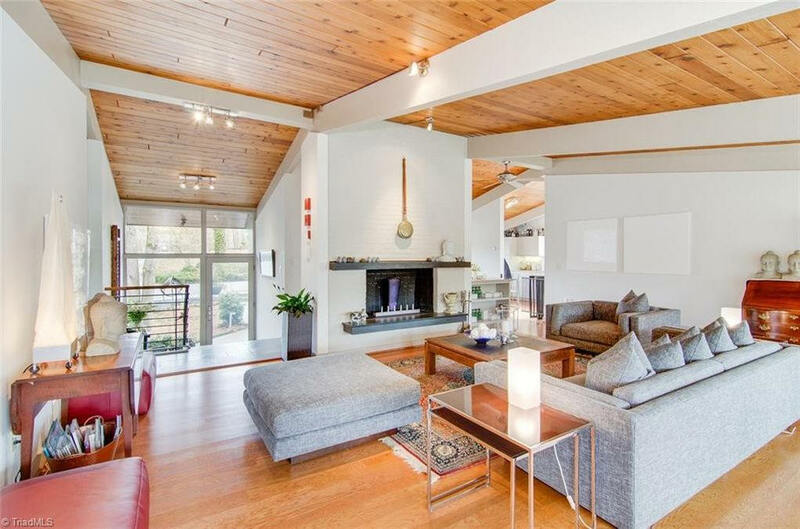 Sold to Sarah Lundin and William Leland. 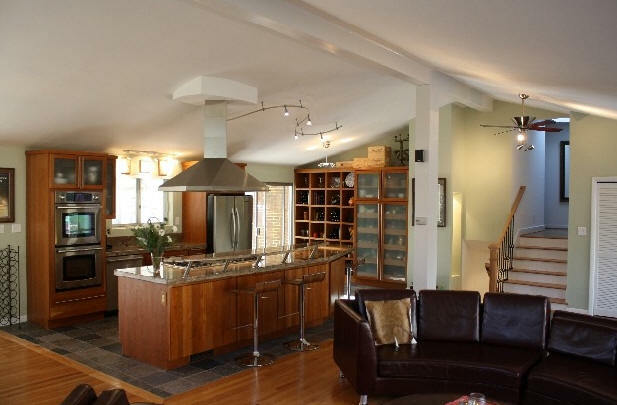 Sold in 2005 to Julia Snow Knerr and Douglas Miron. 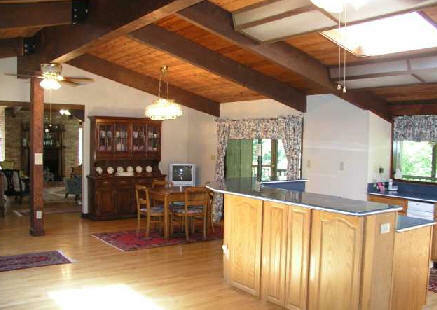 Sold in 2005 to Thomas and Jean Ferguson. Bottom photo by Trey Thomas. 1976 - 137 Carolina Forest Court, Chapel Hill. Various owners. 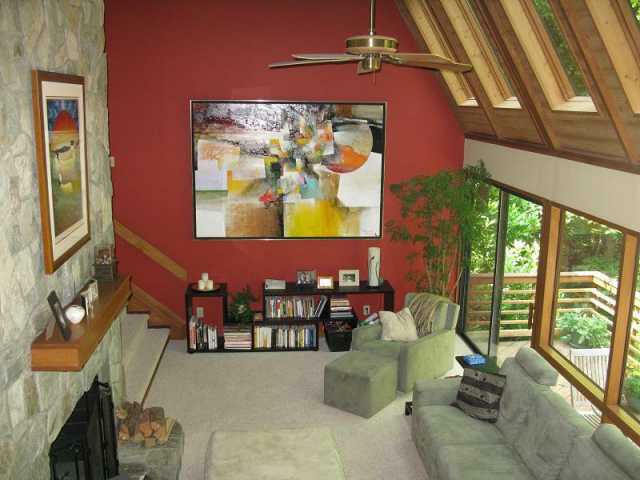 Sold 2004 to Matina L. and Andrew J. Metz. Sold in 2011 to Pandora J. and Brett H. Riggs. 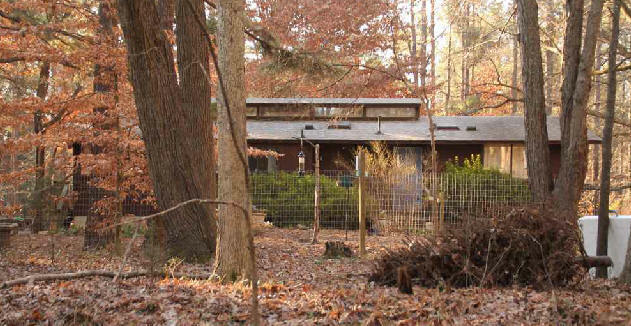 1976 - The Richard and Sharon Coop House, 1417 Arboretum Drive, Chapel Hill. 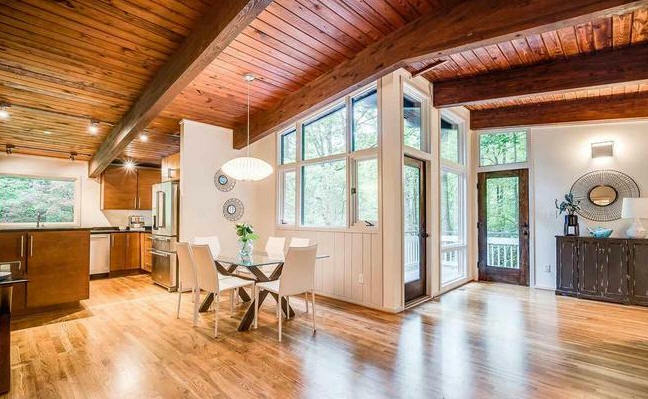 2600 sf. Assembled by Bomar Construction, Robert Bacon. 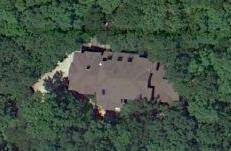 As of 2012 owned by a trustee for Richard Coop. Sold in 2015 to Sandra and Richard Woeller. Photo by Leilani Carter. 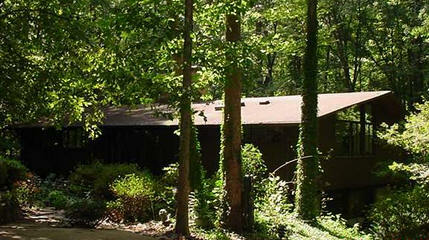 1977 - 107 Spring Hill Forest, Chapel Hill. 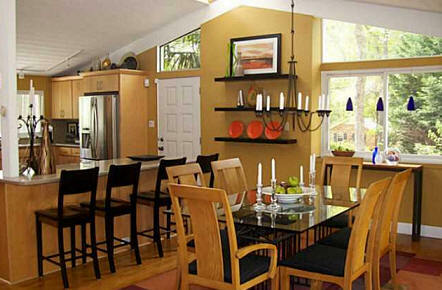 Sold in 2005 to Andrea Ross and Michael Yarger. Renovations by architect Sophie Piesse, built by Actual Size Builders. 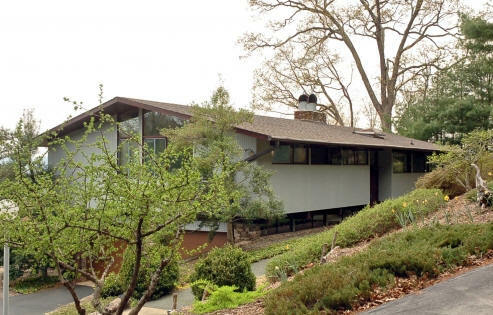 1977 - The Kathy W. and Robert Bruce Gunter Jr. House. 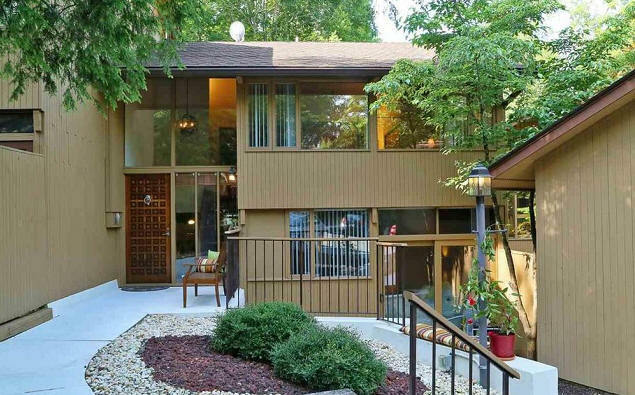 Sold in 1983 to Bernadine and Richard D. Turner. Purchased by a relocation firm. 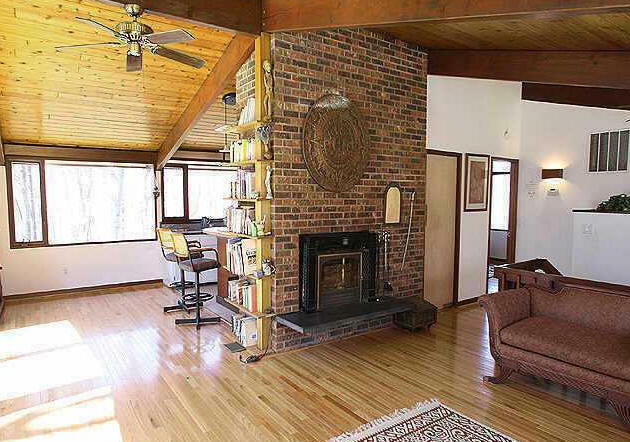 Sold in 1991 to Melanie E. and Paul A. Gaudon. 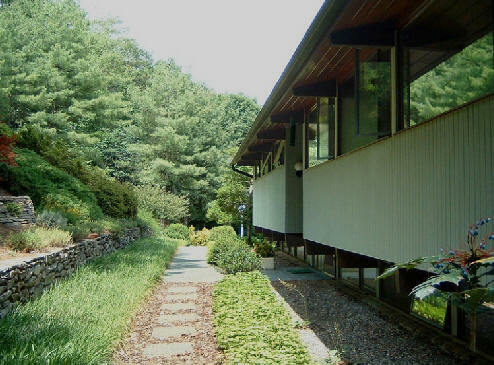 1977 - The Ronald and Margery Wiegerink House, 703 Damascus Church Road Lot 25, Chapel Hill. 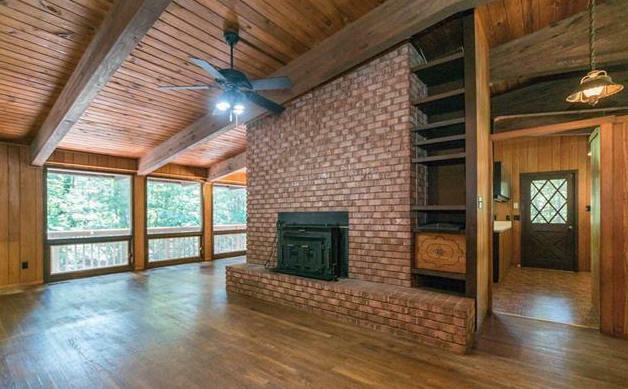 2486 sf. Assembled by Bomar Construction, Robert Bacon. 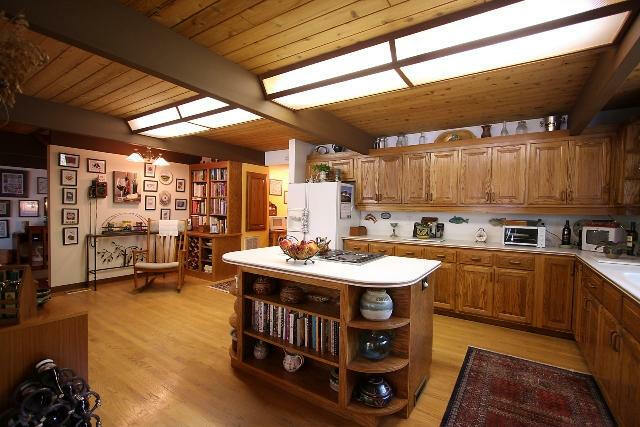 Sold in 1999 to Michael P. and Hannah S. Hannan. Sold in 2013 to Melanie A. and David B. Vandermast. 1977 - The Dana P. and Elizabeth Ripley House, 3601 West Cornwallis Road, Durham. 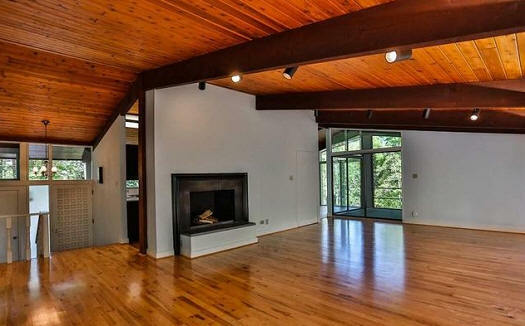 2570 sf. Assembled by Bomar Construction, Robert Bacon. As of 2015 still owned by the Ripleys. 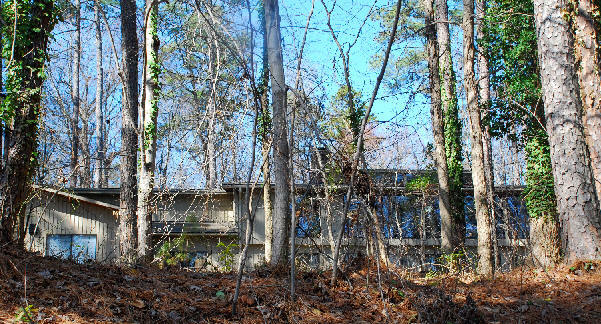 1977 - The Gail B. Hill House, 755 OJ Jones Homestead Road (5945 Cole Mill Road), Durham. Sold in 2017 to Carol M. Taylor. 1978 - The Doris P. and Lawrence I. Gilbert House, 1105 Phils Creek Lane, Chapel Hill. 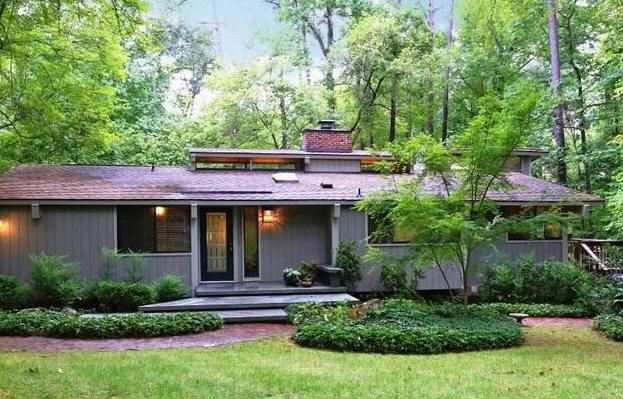 Sold in 2010 to David Leigh and Ellen Wilson. 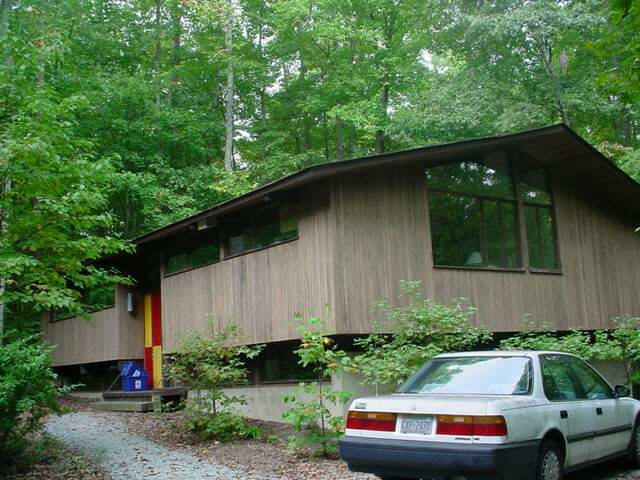 1978 - The Pascal and Donna Trohanis House, 330 Damascus Church Road Lot 27, Chapel Hill. 2485 sf. Assembled by Bomar Construction, Robert Bacon. Needs address verification. 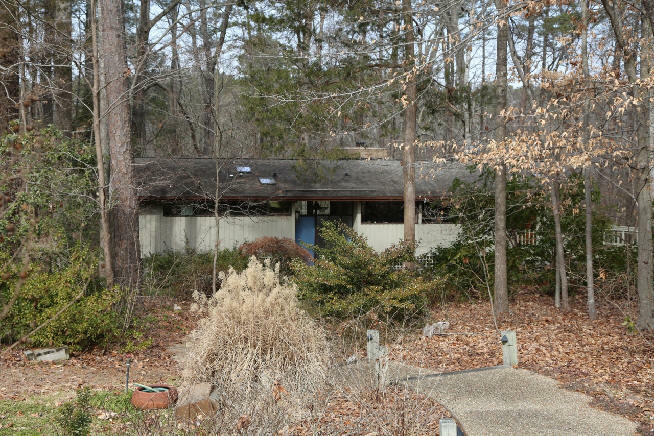 1978 - The Dale and Carolyn Tysinger House, 2405 Monthaven Drive, Durham. 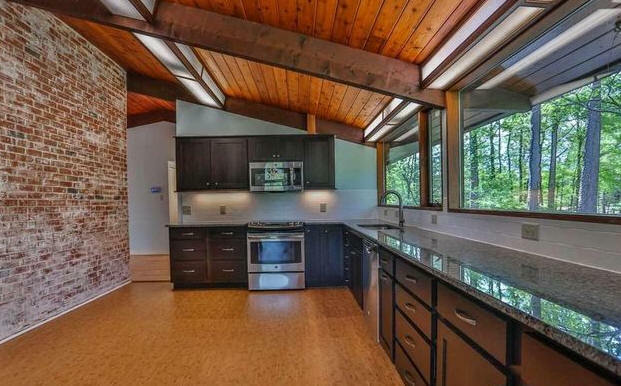 2150 sf. Assembled by Bomar Construction, Robert Bacon. As of 2012 owned by Geoffrey and Pamela Aldridge. Photo by Trey Thomas. 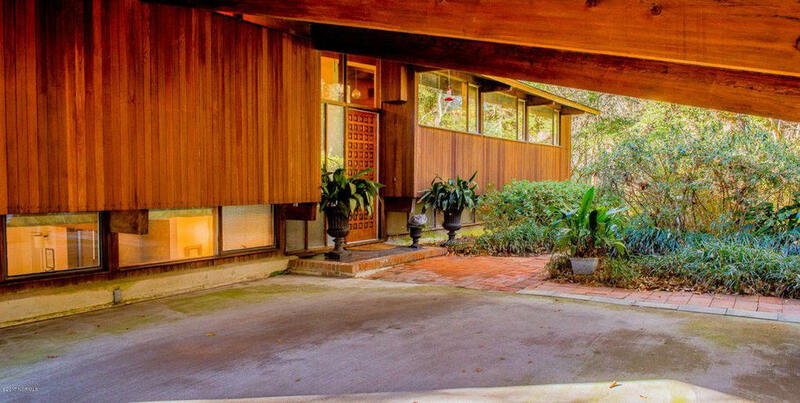 1978 - The Robert and Sarah Porreca House, 5208 Orange Grove Road, Hillsborough. 1538 sf. Assembled by Bomar Construction, Robert Bacon. As of 2012 still owned by the Porrecas. Not visible from the street. 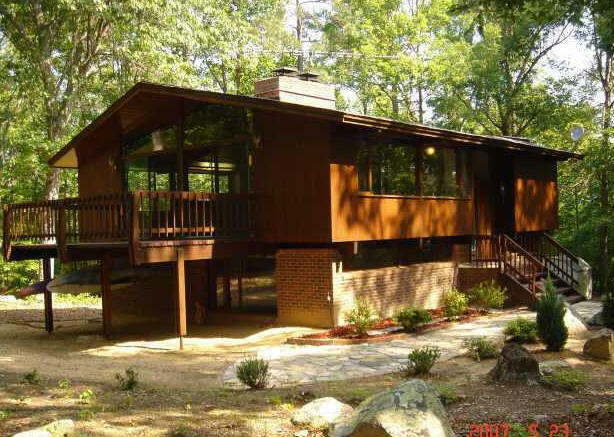 1979 - The Greg and Ruth Bass House, 5102 North Willowhaven Drive, Durham. 2020 sf. Assembled by Bomar Construction, Robert Bacon. Sold to Sid Stroupe. Sold in 2012 to Kathy Hester. 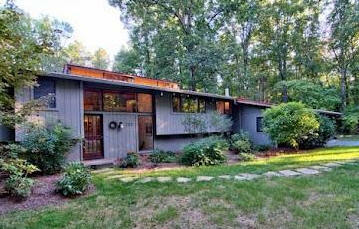 1979 - The David and Jane Green House, 3200 Kenly, Raleigh. 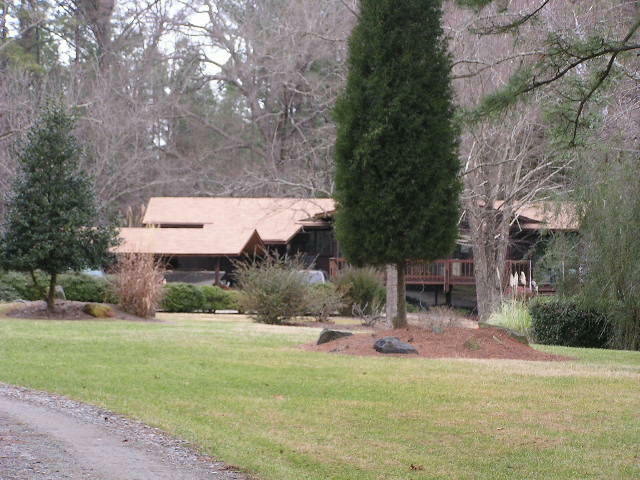 Sold in 1990 to Michael and Barbara Perkins who still owned it as of 2012. 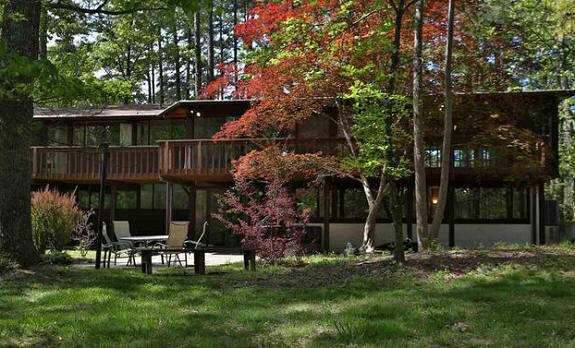 1979 - The Phoebe Lorraine and Richard Earl Forbes House, 113 Forest Cliff Court NE, Concord NC. Transferred to Forbes Trustees in 2009. 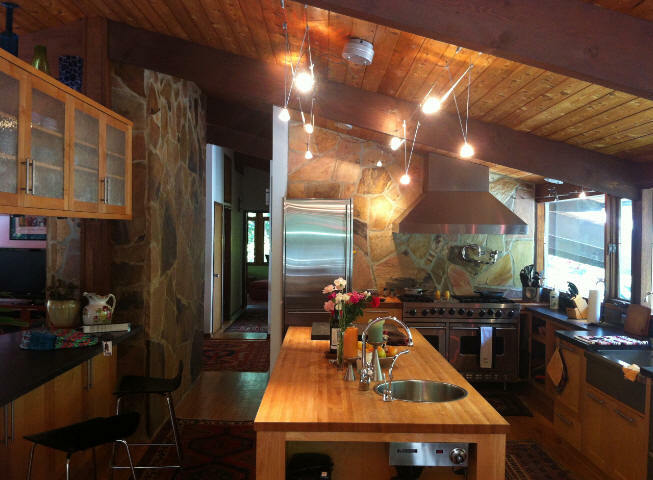 Sold in 2013 to Kristina W. and Anthony R. Dodds. 1980 - The Richard and Hannah Andrews House, 298 Azalea Drive Lot 30, Chapel Hill. 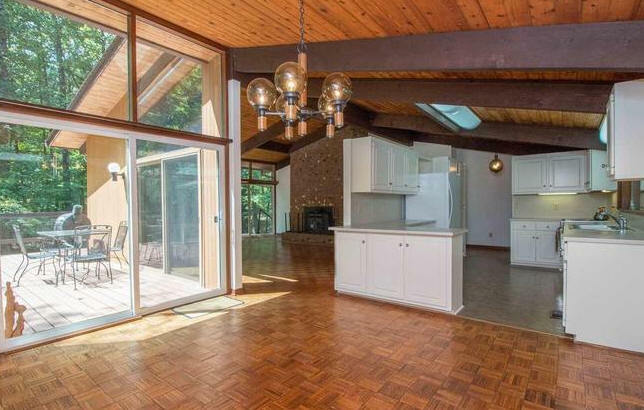 2568 sf. Assembled by Bomar Construction, Robert Bacon. As of 2012 still owned by the Andrews. Photo by Leilani Carter. 1980 - 248 Lakeview Drive, Sanford. Sold in 2018 to Jenny Gray-Bedick. 1980 - The Morris and Paulette Weisner House, 10 Wayside Place, Durham. Sold to Paulette Weisner. 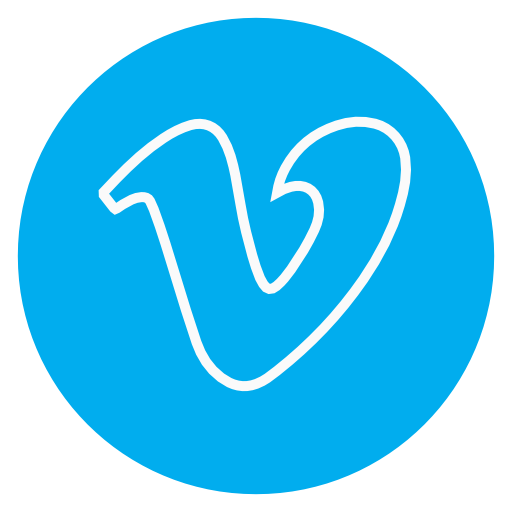 Sold in 2013 to Stefano Ditalia and Veronica Lubkov. 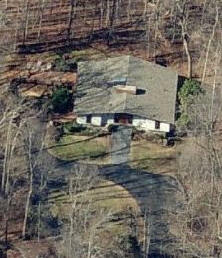 1980 - The John Mullen and Frances H. Friday House, Lot #1 Farrington Rd, Chapel Hill. 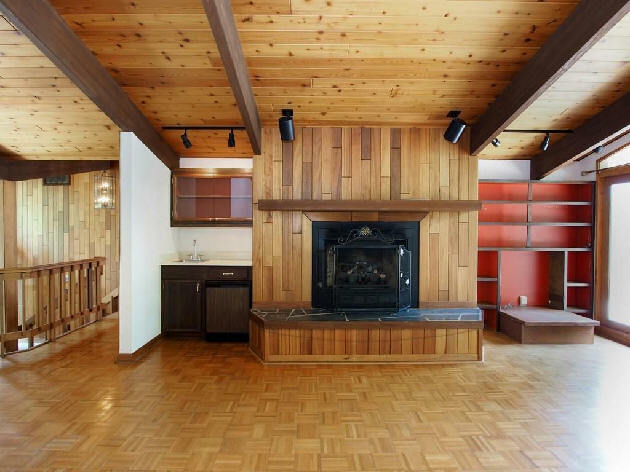 2268sf. Assembled by Bomar Construction, Robert Bacon. 1980 - The Mary Pettis House, 314 Winter Drive, Chapel Hill. 2109 sf. Assembled by Bomar Construction, Robert Bacon. As of 2012 owned by Betsy Fenhagen. Photo by Trey Thomas. 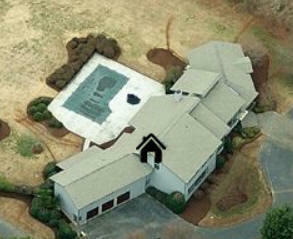 1980 - 169 Trail Blazer Lane, Highlands NC. 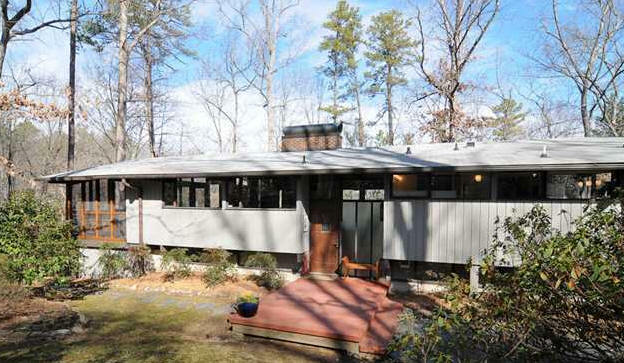 Sold in 2017 to Henry Darby and Jo Ann Paschall. 1980 - The Ara and Hjordis Tourian House, 2903 Montgomery Street, Durham. 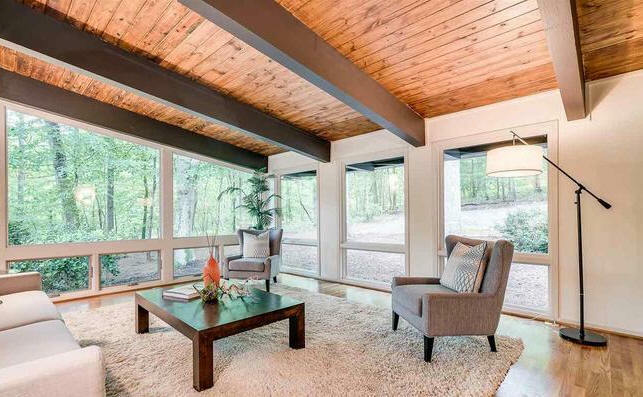 2564 sf. Assembled by Bomar Construction, Robert Bacon. As of 2012 still owned by the Tourians. Photo by Trey Thomas. 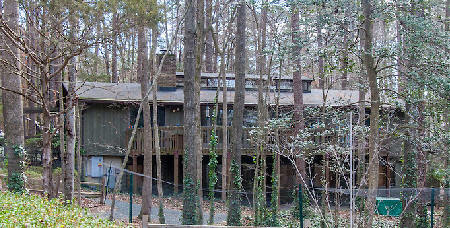 1980 - The Abraham and Laura Kierszenbaum House, 106 Wild Turkey Trail, Chapel Hill. 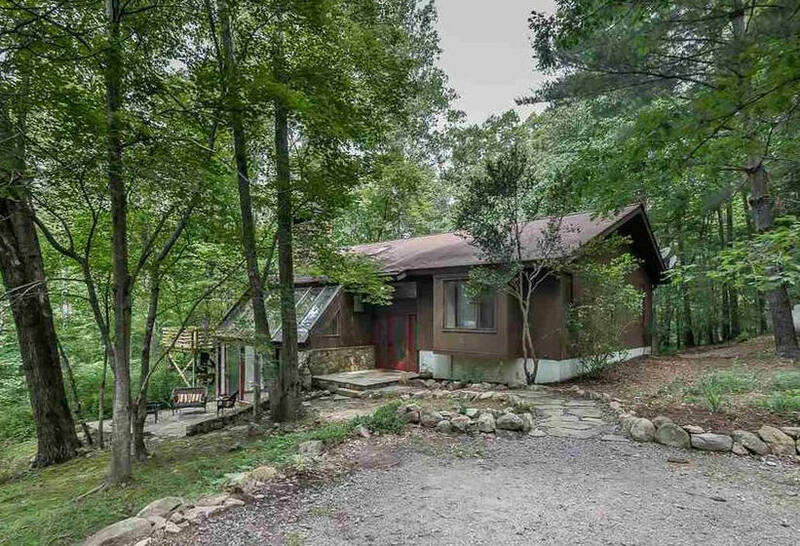 3413 sqft on 4.5 acres. 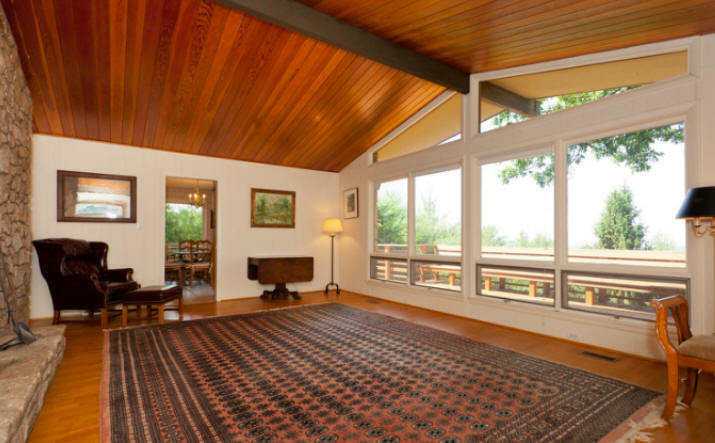 Sold to F. Weston and Betsy Fenhagen. Sold to G. Vann and Bernadette Bennett. 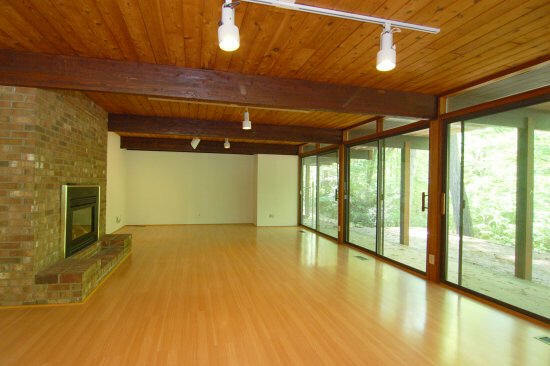 Sold in 2002 to Peter Bogart and Kerry Shear Lumish. 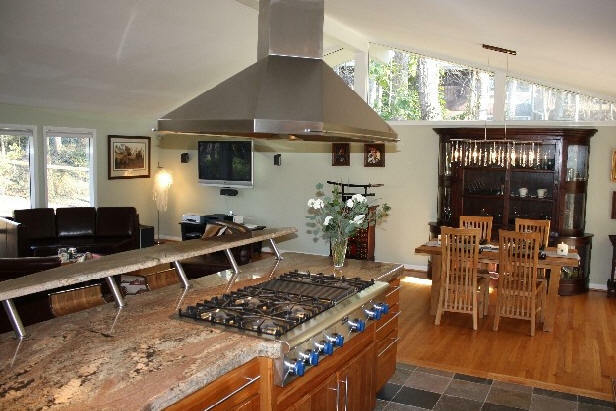 Kitchen was remodeled in 2004. 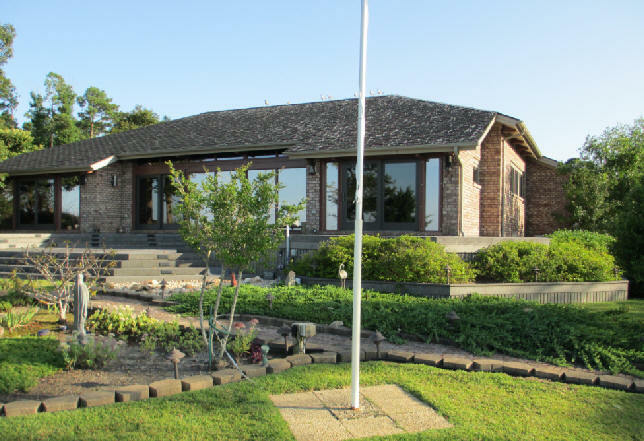 Sold in 2014 to David and Toni Darville. Photo by David Darville. 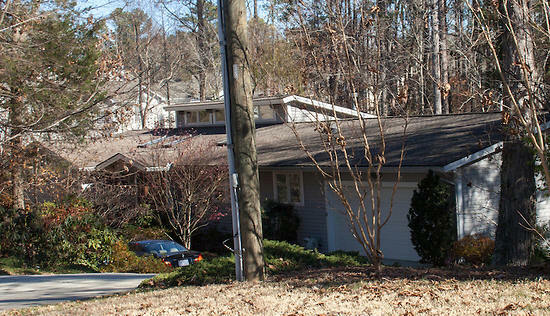 1981 - The Manuel D. and Karen Wortman House, 1329 Beechwood Lane (formerly 3 Beechwood), Chapel Hill. 2109 sf. Assembled by Bomar Construction, Robert Bacon. Sold in 2016 to Charity Kirk, Bradley Saul and Mary Kirk Wilkinson. Photo by Trey Thomas. 1981 - The Jeremiah J. Nowell Sr. House, 428 Bob Horton Road, Apex NC. Built by the owner and a friend. Still in the Nowell family as of 2011. 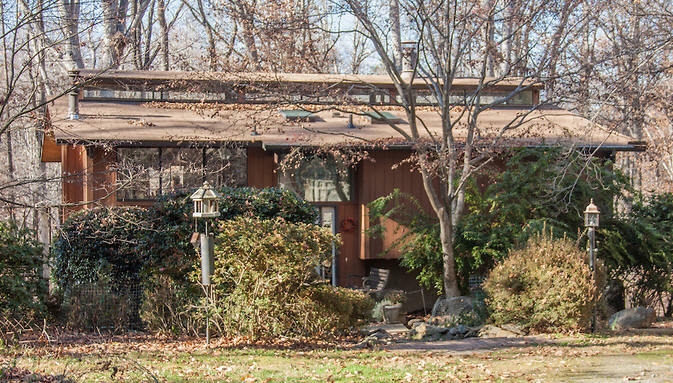 1981 - The Alfred and Janet Sanfilippo House, 3315 Stoneybrook, Durham. 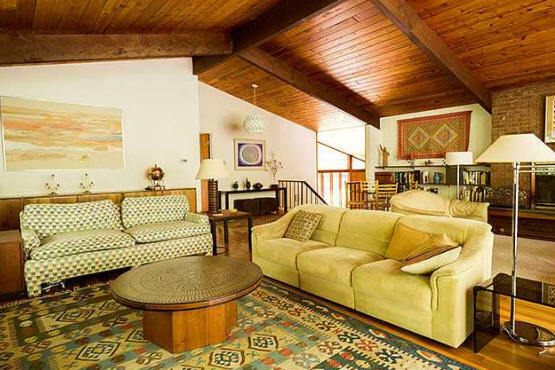 Sold in 1995 to William M. and Mary Ellen Perry. 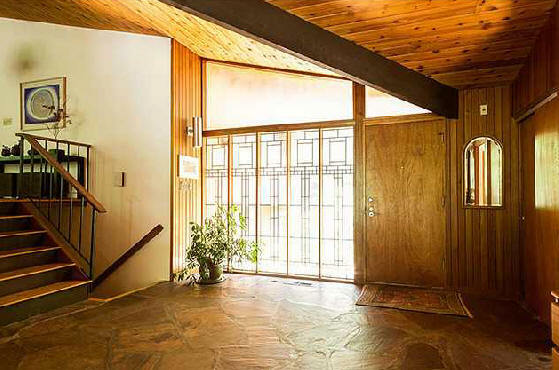 Sold in 1995 to Randall and Linda Weghorst. 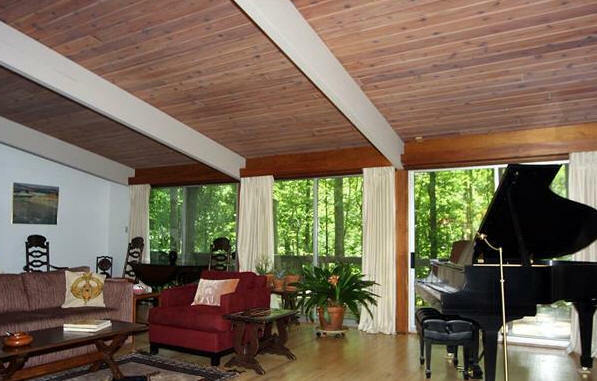 Sold in 1997 to Michael and Laura Luger. Transferred to Laura Luger. Sold in 2013 to Zamab Samad and Muhammad H. Khan. 1981 - The Nancy R. and George L. Withey Jr. House, 12 Park Court, Pinehurst NC. For sale in 2018. 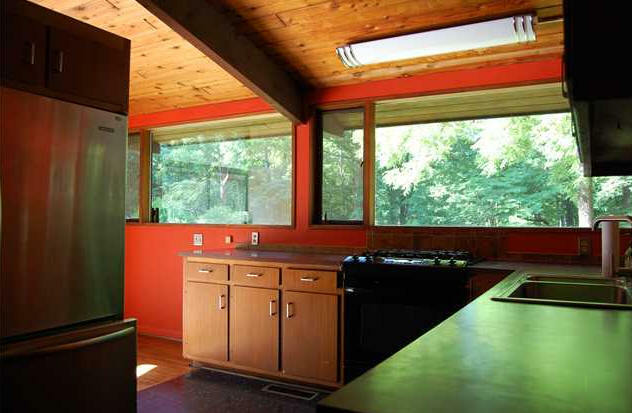 Sold in 1998 to Joyce and Geoffrey Scott Fisher. Sold in 2018 to S. and Robert E. Nelson IV. 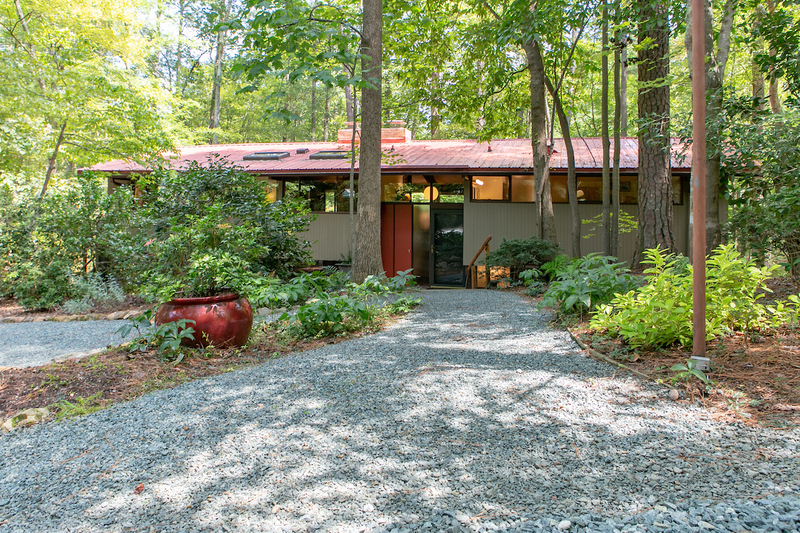 1982 - The James and Pamela M. Swarbrick Residence, 145 Carolina Forest Road, Chapel Hill. 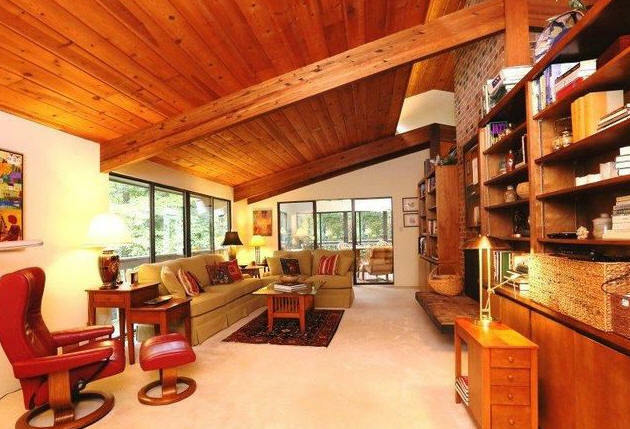 Sold in 1993 to Edward D. and Barbara A. Paradise. 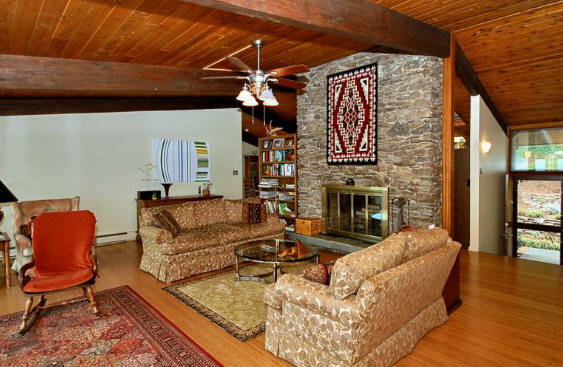 Sold in 1998 to Dino S. and Marilyn E. Cervigni. 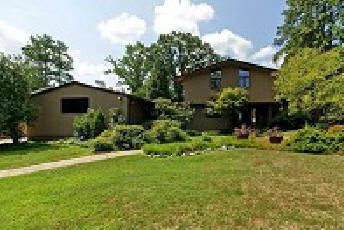 Sold in 2012 to Mary J. Scholz Hoffert and Marvin Jay. Sold in 2017 to Alison T and Malcolm M. Smith. 1983 - The David K. & Joan C. Guilkey House, 2 Silversides Trail, Bald Head Island NC. 1983 - The Adelinie M. and James J. Kenny House, 134 Lakota Lane, Tryon NC. Deeded in 2007 to Adelline M. Kenny. Transferred in 2016 to A. Mary Kenny Lifetime Trust. Sold in 2016. 1983 - The David and Darcy Paletz House, 10 Harvey Place, Durham. 2610 sf. Assembled by Nobscot Construction, Robert Bacon. Sold several times. As of 2012 owned by Bruce and Barbara Jentleson. Bottom photo by Trey Thomas. 1984 - The James Edward and Lorraine S. Lowe House, 23 Surrey Lane, Durham. Deeded 2001 to Lorraine S. Lowe. Sold 2011 to Kenneth Alan McNish. 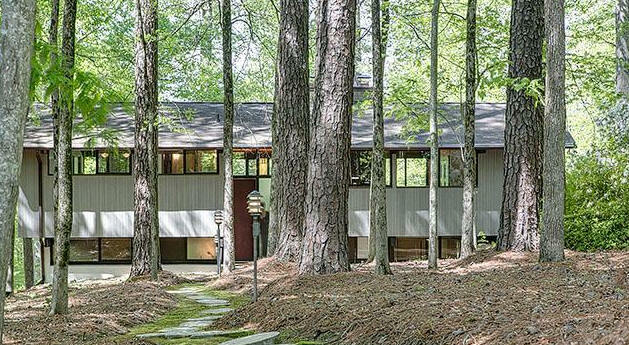 1984 - The Redford and Virginia Williams House, 5811 Buck Quarter Road, Hillsborough NC. As of 2012 still owned by the Williams. 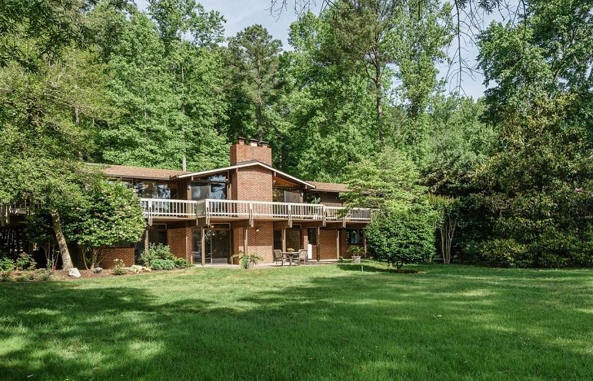 1984 - The Robert C. and Blanche Bast Jr. House, 6108 Turkey Farm Road, Chapel Hill. 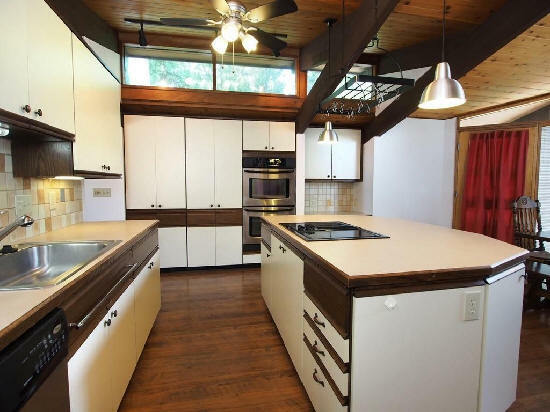 Built by J. P. Goforth Properties. Has an addition on the front. Sold in 2003 to John L. and Victoria Terry. 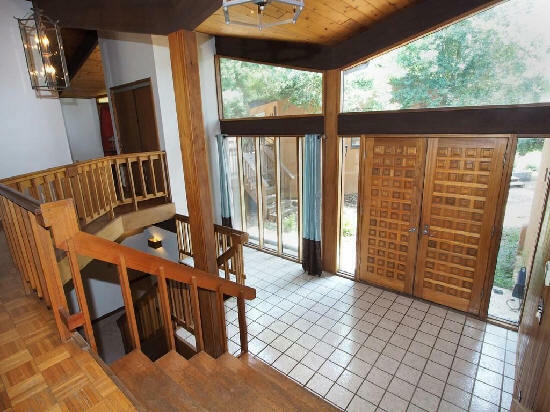 Sold in 2015 to Pat and Kate Flores. 1984 - 104 Arbutus Place, Chapel Hill. Sold in 2015 to Susan and Richard Barrows. Sold in 2017 to James A. McKeand. 1984 - 107 Arbutus Place, Chapel Hill. Sold in 2018 to Melanie M. Pina and Jonathan F. Fay. 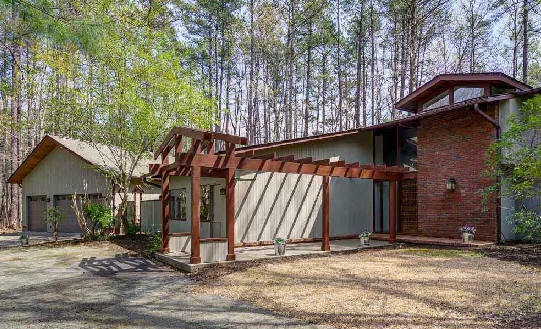 1984 - The Frederick A. Jr. and Mary L. Klumpp House, 6508 Saddlepath Circle, Raleigh NC. 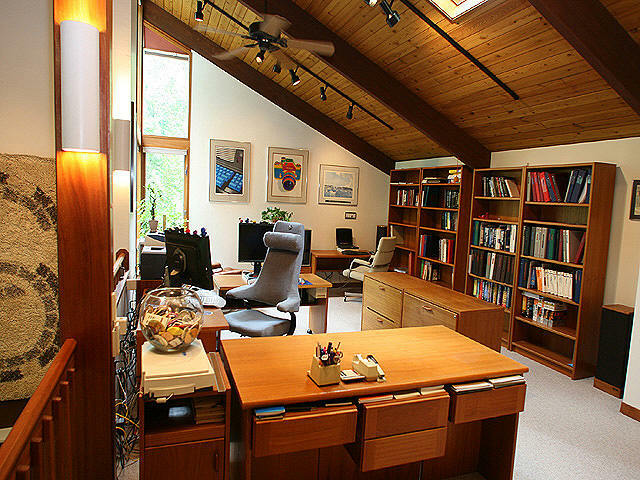 Sold in 2000 to Nancy T. and Kenneth L. Krimm. Sold in 2009 to John Bender. 1984 - 104 Barnhill Place, Chapel Hill NC. Sold in 2017 to Carole L. and Kyle C. Strickland. 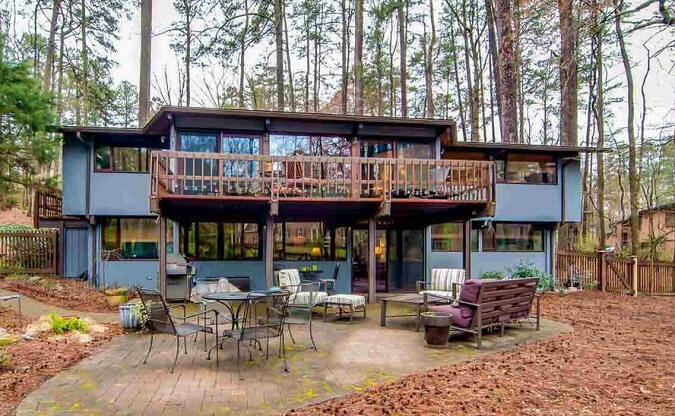 1985 - The John and Catherine Williamson House, 12401 Six Forks Road, Raleigh NC. As of 2014, still owned by the Williamsons. 1985 - The Julio and Irene Meraz Residence, 1732 Brooks Avenue, Raleigh. Sold to William Hale in 1989. Sold in 2007 to Peter Ungermann. Sold to David and Avery Knight in 2010. 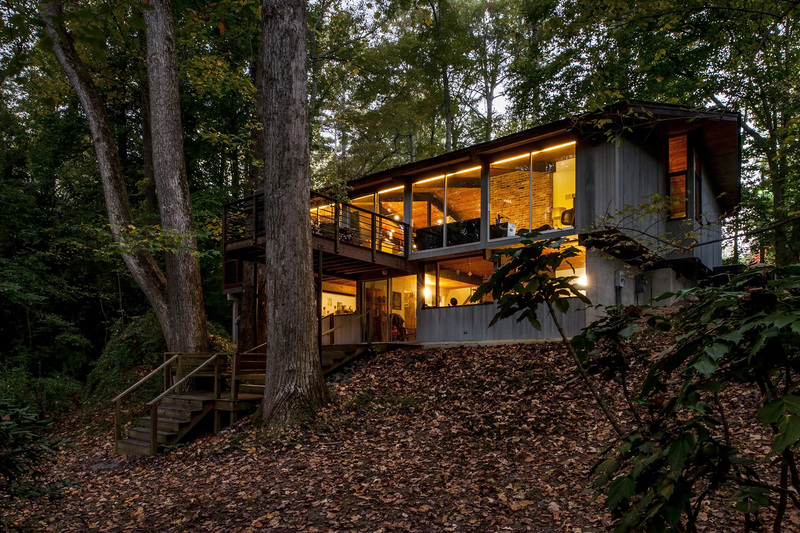 Sold in 2014 to Mary H. and William J. Blanton. 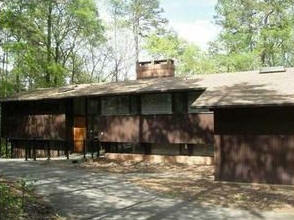 1985 - 1 Lake Vista Lane, Pinehurst NC. Sold in 2016 to Kimberly and Dennis Scruton. 1985 - The Carol P and Clarence W. Jova residence. 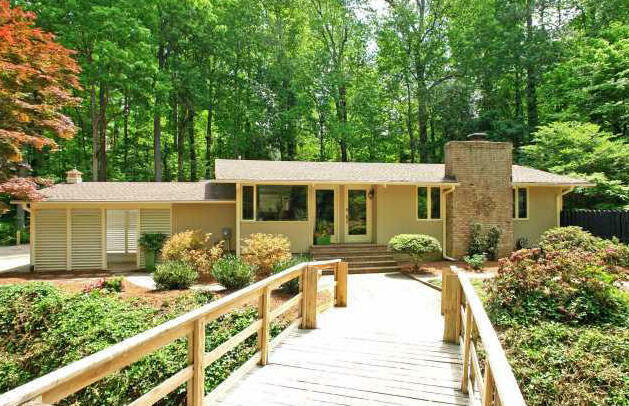 935 Boothe Hill Road, Chapel Hill NC. Sold in 1990 to the Viveros. Deeded in 2004 to the O. Humberto and Yolanda Viveros Revocable Living Trust. 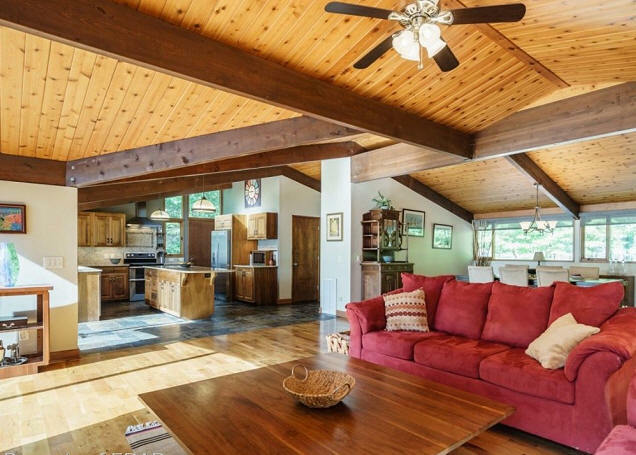 Sold in 2018 to Johnna Jalot and John A. Gibson. 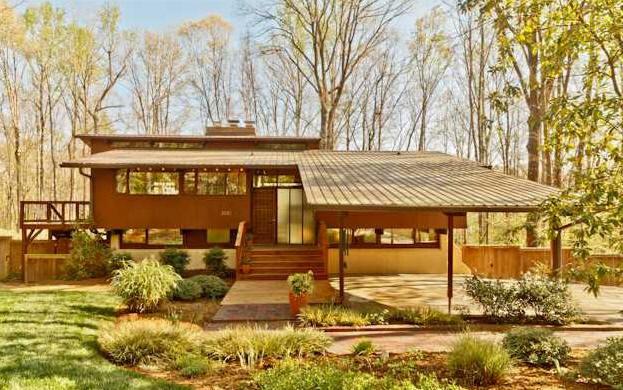 1986 - The Barbara and Erwin Mach House, aka the Cox-Sood House, 98 Stone Ridge Place, Chapel Hill. 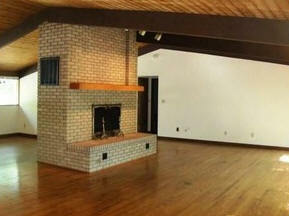 The original house, top two photos, was a copy of a Deck House the Mach's owned previously out of state. 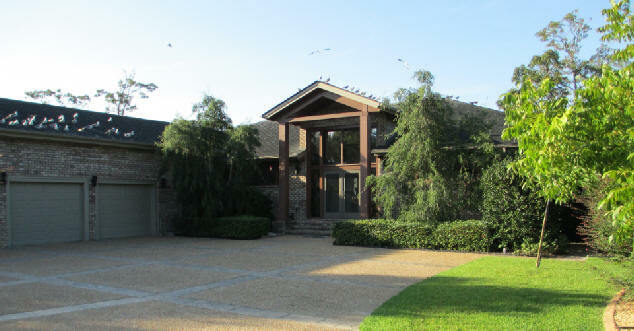 Sold in 2011 to Christopher Cox and Annu Sood. 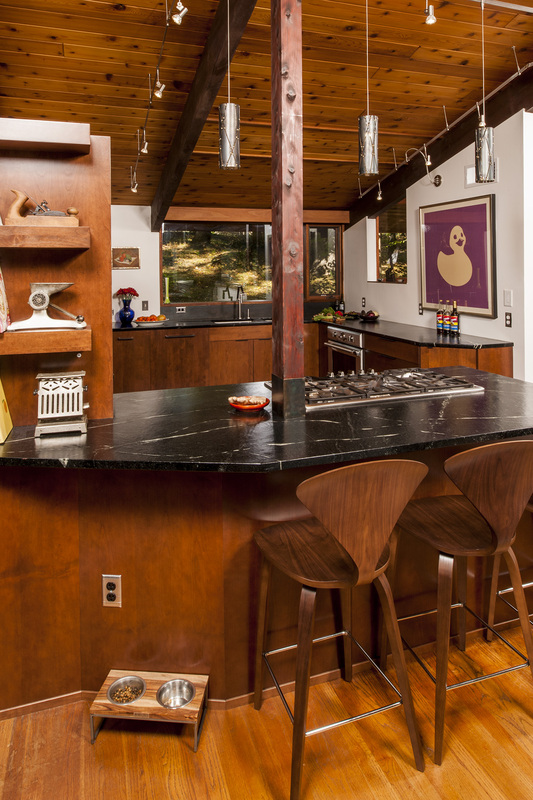 2011 renovation designed by Matt Griffith and Erin Sterling Lewis; built by Redfoot and Weber. 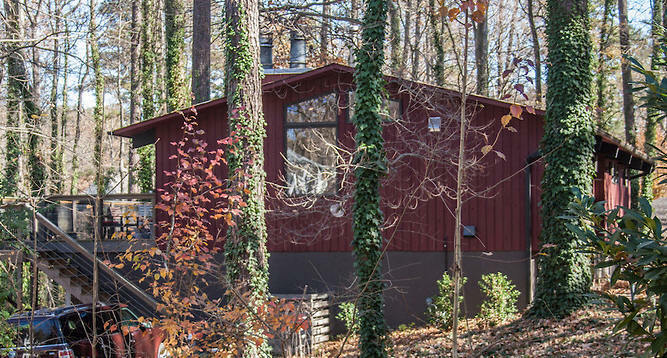 Part of the AIA Triangle 2012 Tour. Bottom photo by Nicole Alvarez. 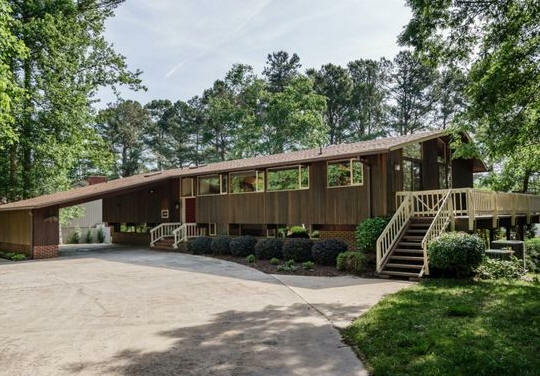 1986 - The Roy W. Roth House, 4019 Stoneycreek Road, Chapel Hill. 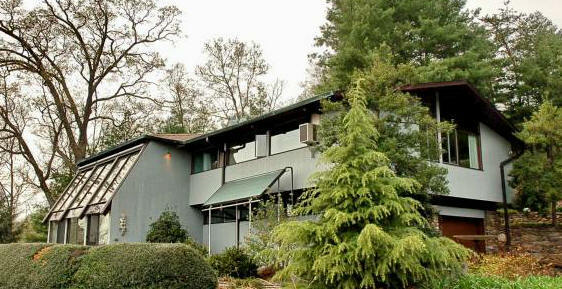 1987 - The King and Vivian Owyang House, 1508 Jones Ferry Road, Chapel Hill. 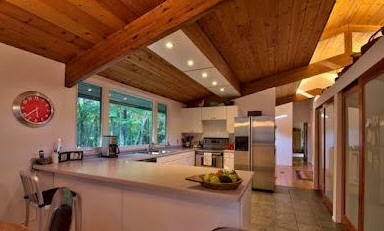 Sold in 2005 to Harvey Goldstein and Meredith Mayer. Sold in 2015 to Lisa C. Waller and Thomas A. Greco. 1988 - The Geoffrey and David Simmonds Residence, 10429 Leslie Drive, Raleigh. 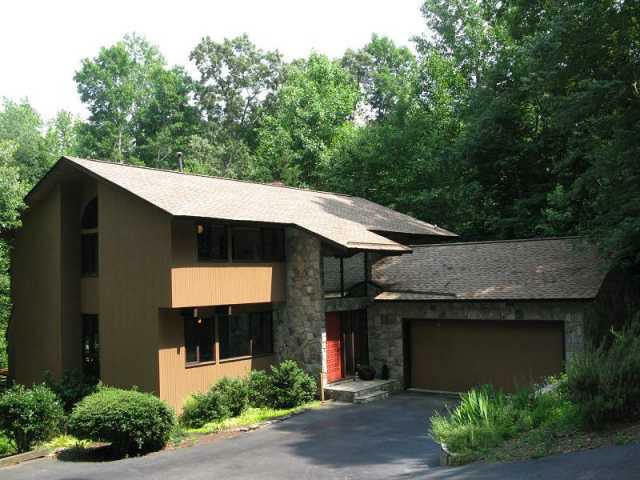 3000 square feet, 4br, 3b on 1 acre. 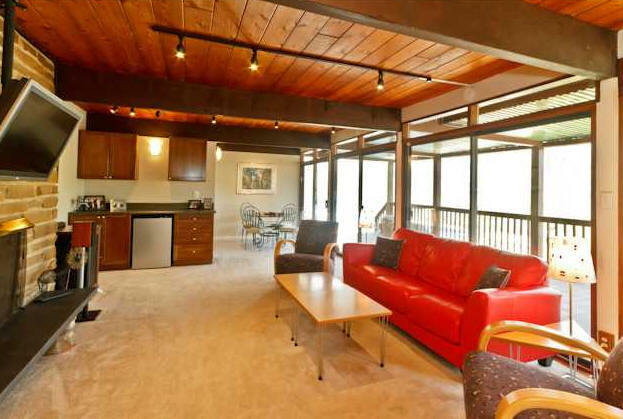 Sold in 1991 to Easterly Properties. 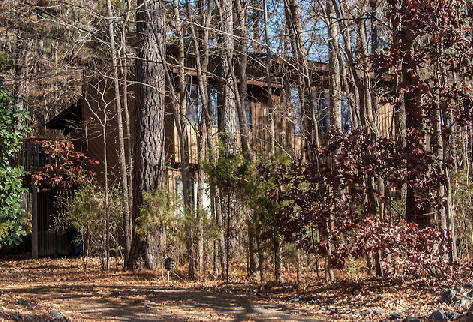 Sold in 1991 to Benjamin H. Graves III. 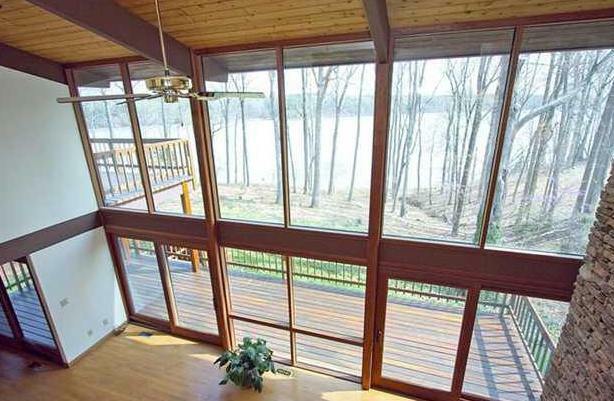 Sold in 2000 to Shannon and Jennifer Lasater. Sold in 2007 to Patrick E. Duffy. 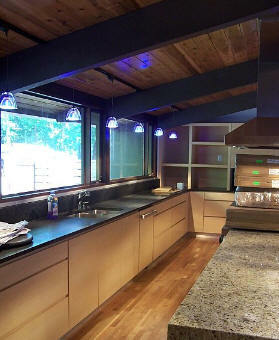 Remodeled kitchen. 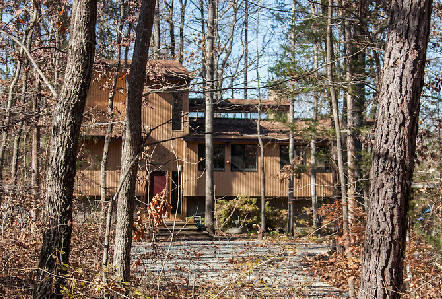 Sold in 2009 to Garth D. Flanagan. 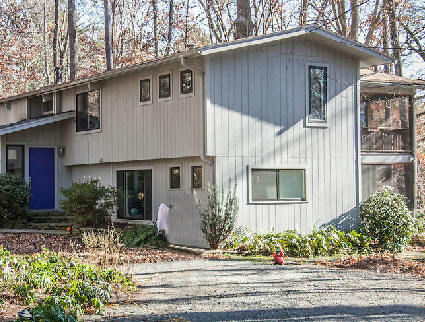 1988 - The Charles S. and Ellen M. Johnson house, 902 Kings Mill Road, Chapel Hill. Built by Bomar Construction. Still owned by the Johnsons as of 2013. Photos by Duffy Healey. 1988 - 505 Shinnecock Court, New Bern NC. Sold. 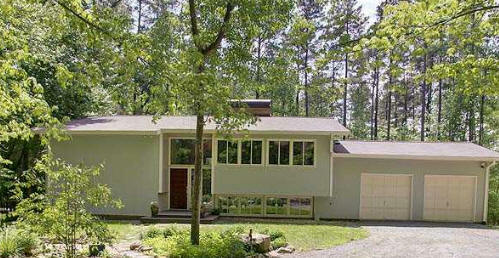 Sold in 2011 to third owners Jon and Jane Olstad. 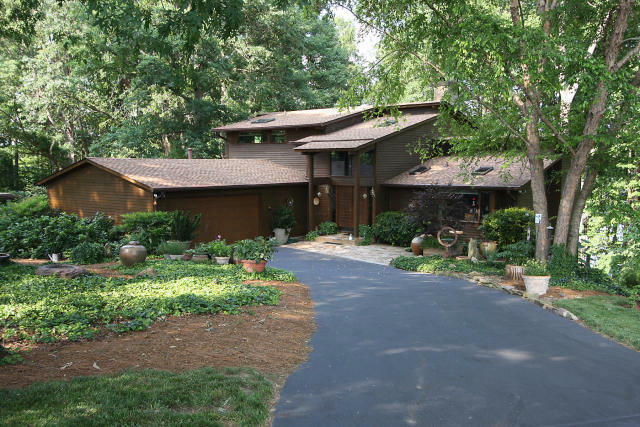 1989 - The Robert and Connie Shertz Residence, 7229 Blaney Bluffs Lane, Raleigh, right on Lake Wheeler. Sold in 2011 to Teresa C. and Herbert G. Sullivan. 1992 - The Michael O. and Carolyn Moore House, 50114 Manly, Chapel Hill. In Governor's Club, Chatham County. 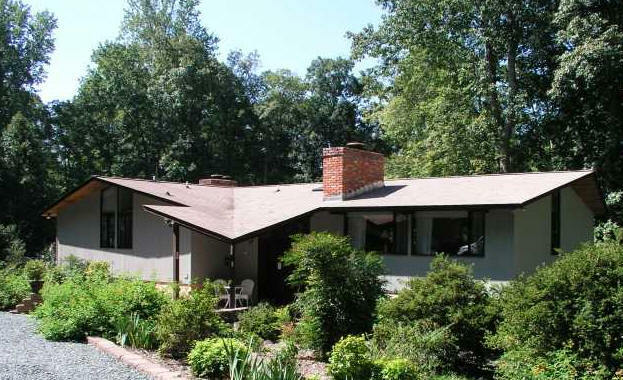 Sold in 2000 to Dennis and Dori Nagy. 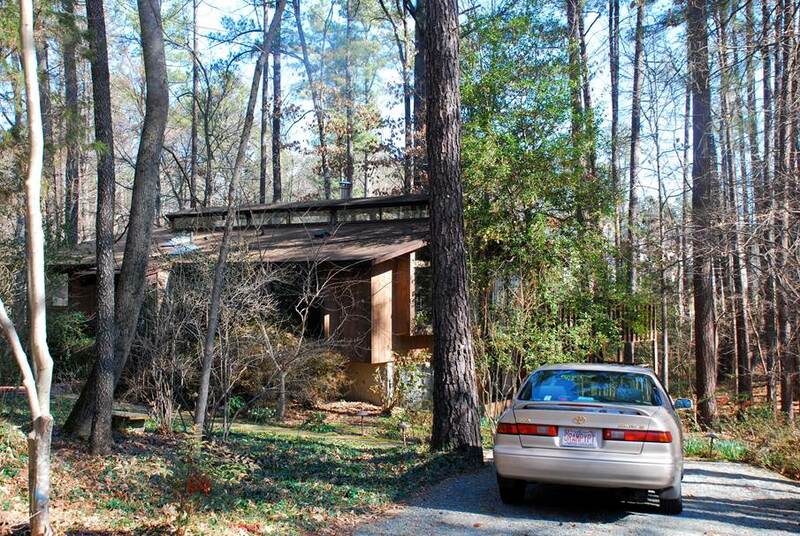 1994 - The Jeffrey and Linda Charles House, 5904 Treetop Ridge, Durham NC. 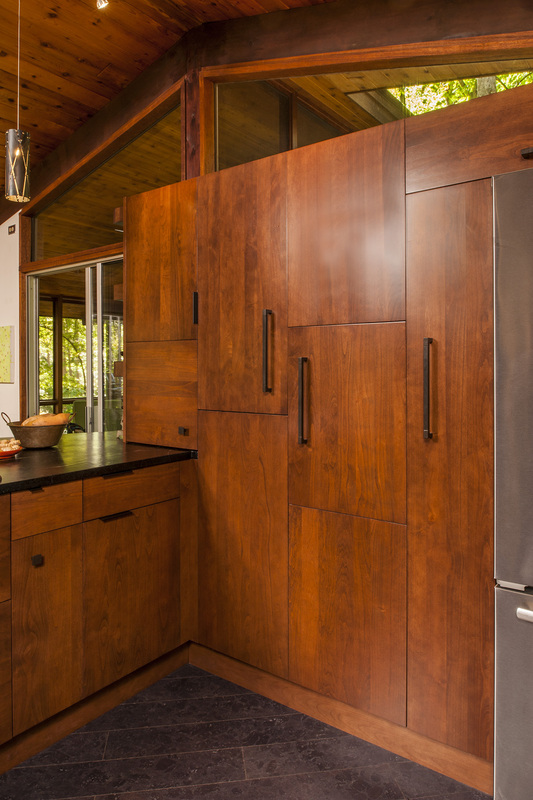 Built by Halcyon Home, Inc., Don C. Walter. Located in Orange County. For sale in 2018. 1995 - 4025 Garrett Drive, Durham. Sold to John S. and Kathleen March. Sold in 2005 to William F. Fairey. 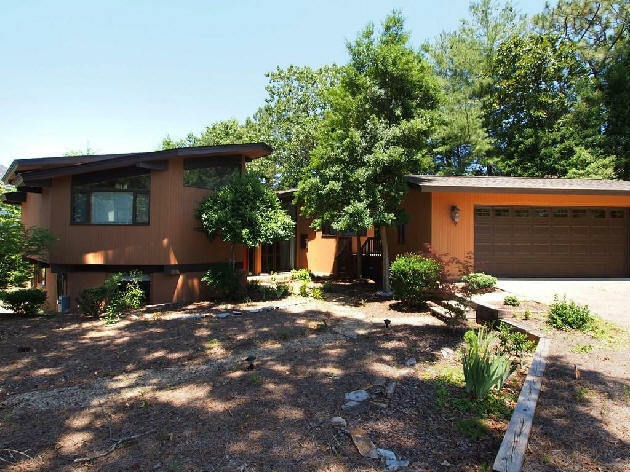 Sold in 2018 to Kristin W. and James S. Bowers II. 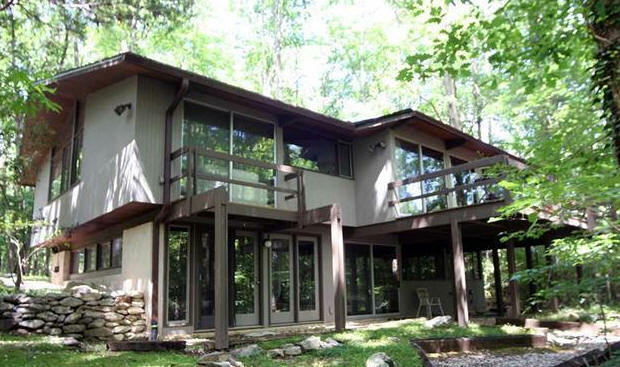 1995 - 758 Turnberry Drive, Roaring Gap (Glade Valley) NC. 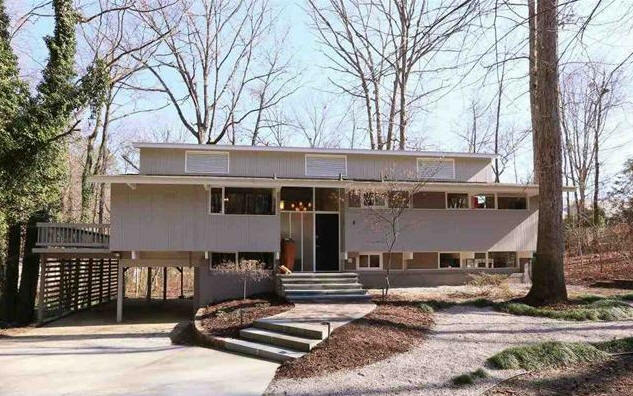 Sold to architect Edward Prince. 1995 - 4025 Garrett, Durham NC. For sale in 2018. 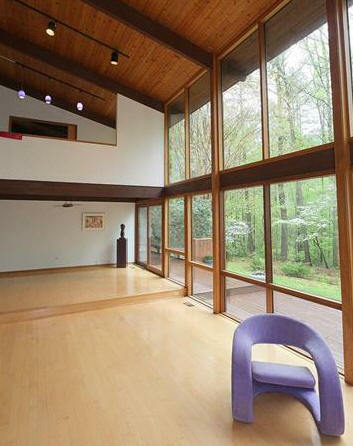 1996 - The Joanna E. Pagano House, 42003 Worth, Chapel Hill. A traditional interpretation. 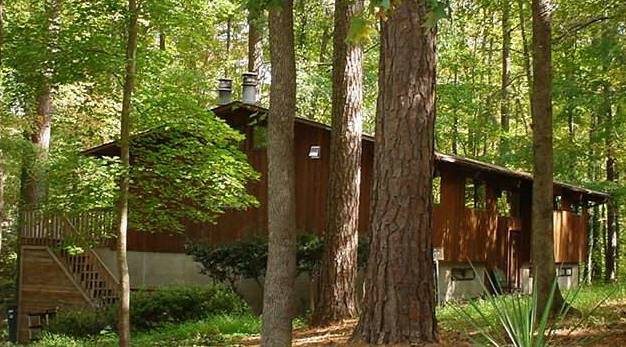 Located in Governor's Club, Chatham County. 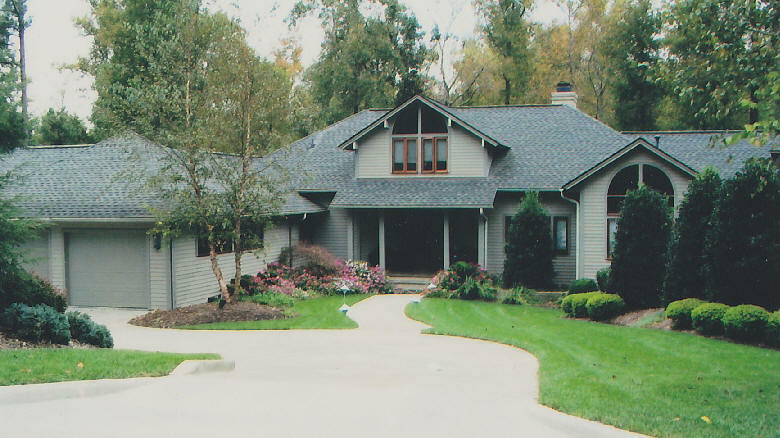 1997 - The David Sykes Residence, 3504 Creekwood Bluffs Court, Apex. 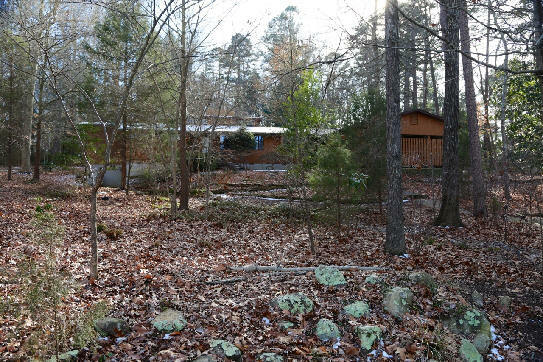 1.74 acres. 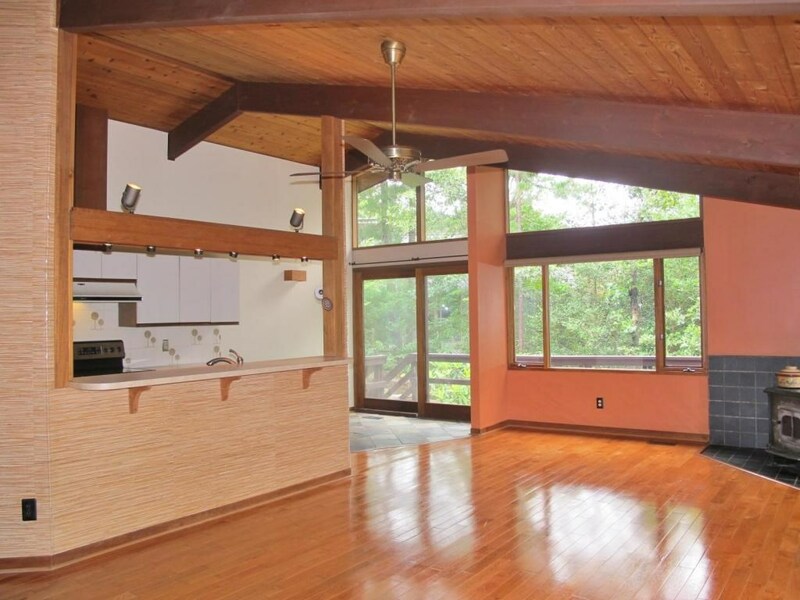 2917 square feet. Sold in 2009 to Ken and Mei Lin Huang. 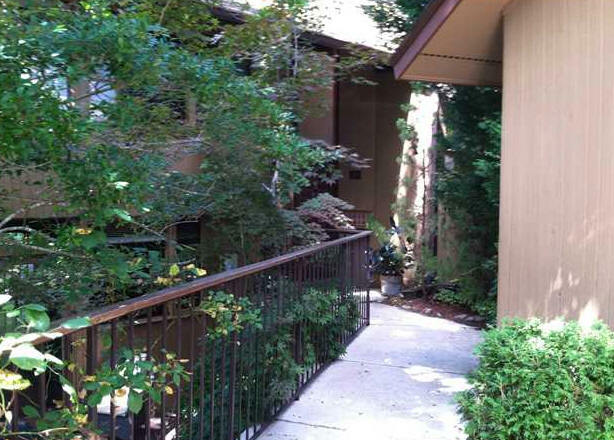 Sold in 2016 to 3504 Creekwood Bluffs LLC. 1997 - The Mary Balliet House, 15 Haven Road, Pittsboro NC. Built by Don Walter. 10000sf. Transferred to Mary Balliet Trust. 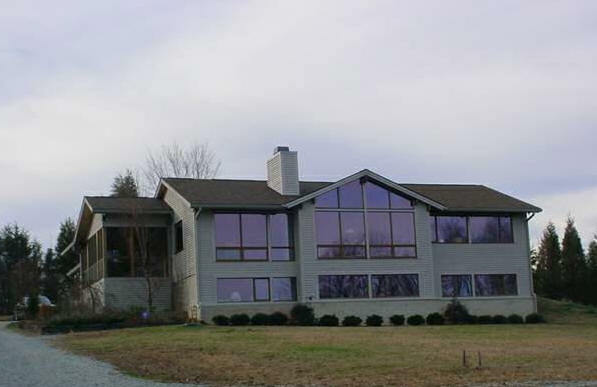 1998 - The Randall and Linda Marcuson House, 3001 Old Weaver Trail, Creedmoor NC. Commissioned 1997. 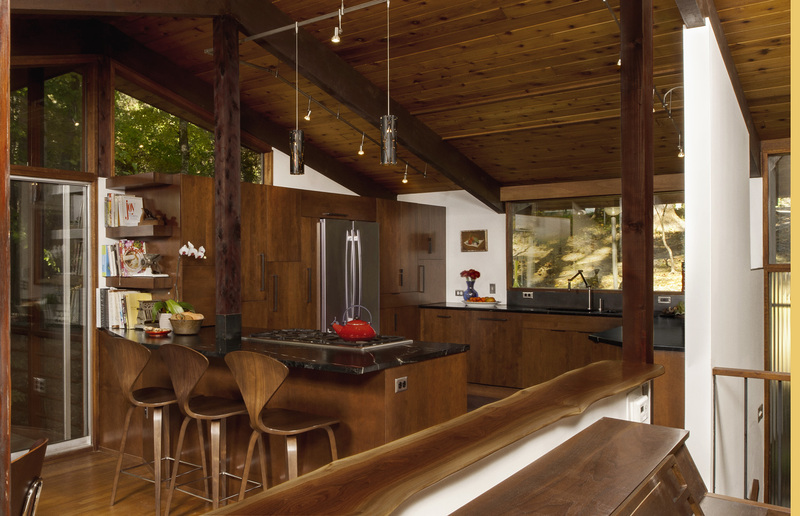 Designed in conjunction with the Deck House architect David Vanacola and built by Don Walter of Halcyon Builders. 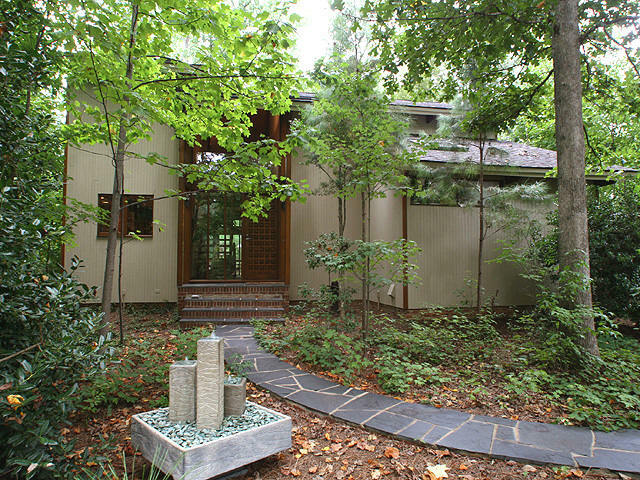 The Marcusons spent three years in Japan in the early 1980s and were inspired by Japanese architecture and farmhouses. 2000 - The James Watson House, aka the Watson-Hollinshead House, 8407 Meadow View Lane, Bahama NC. 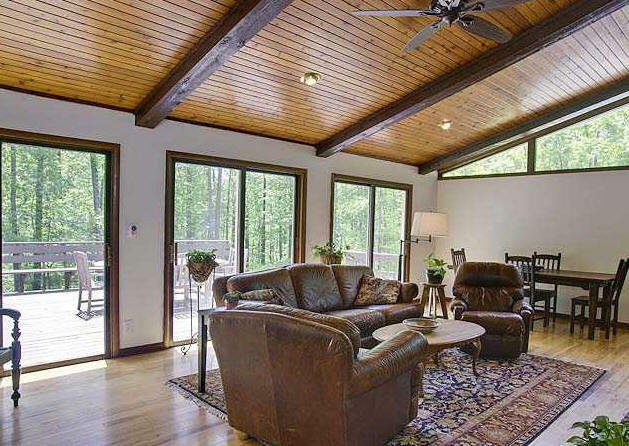 Built by Scott Dupre of Leesville Construction.Sold to Sean Hollinshead. Sold in 2004 to Cendant Financial Services Corp. Sold later in 2004 to Robert S. Leeds. 2001 - The Sheridan W. and Christa T. Johns House, 3313 Rolling Hill, Durham. Built by Scott Dupre of Raleigh. Sold in 2012 to Susan and Michael Collins. 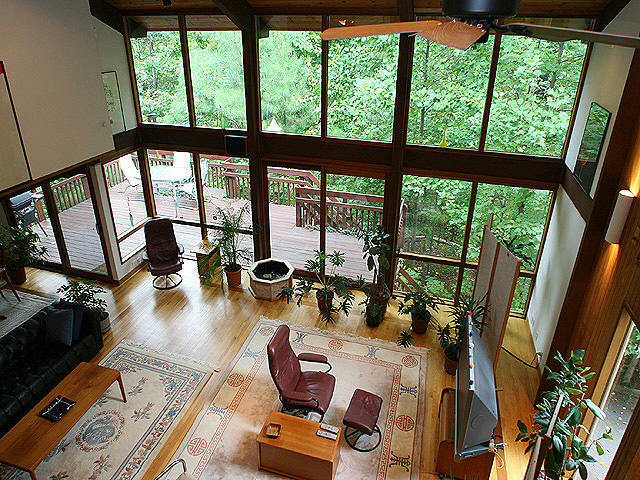 Top photo by Trey Thomas..
2002 - The Peter Geisler House, 114 Dory Court, Havelock NC. One of several built by John Cutter in Craven County. 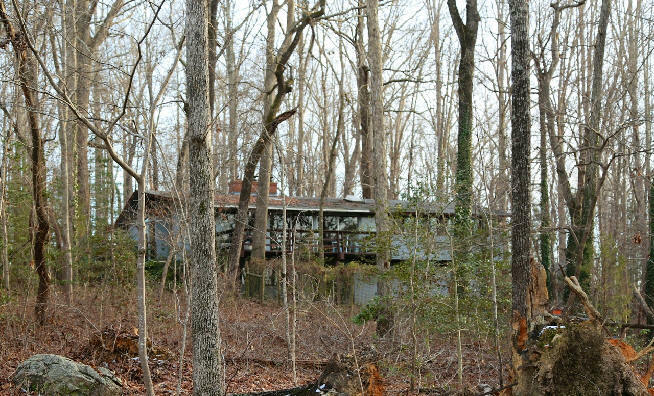 One of the first brick Deck houses in North Carolina. Because it is so close to the salt water, several modifications had to be made. 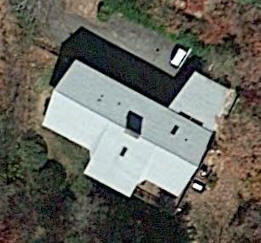 The roof is Ecotile shingles. Year unknown - The Don C. Walter House, 154 West Summerwood, Littleton NC. Built by Don C. Walter. Has been sold. 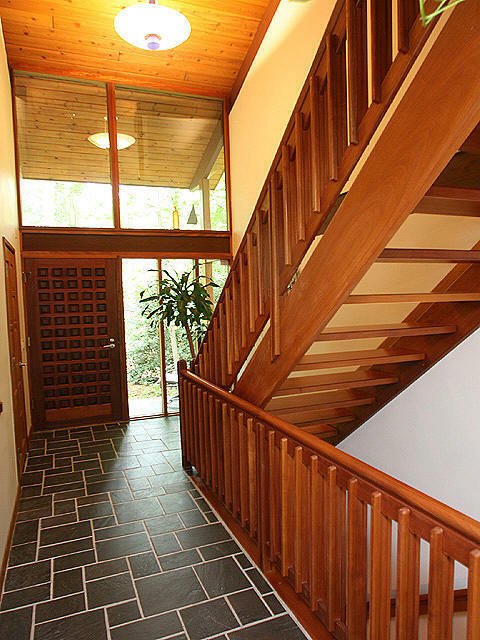 Year unknown - The Kuno Suzuki House, Durham NC. Address unknown. Built by Don C. Walter. Year unknown - The Tom and Ellen Forqurean House, near Mt. Sinai Church Road, Durham NC. Address unknown. Built by Don C. Walter. Sources include: David Sykes, Johnny Randall, Boston Globe, Robert Bacon, Susan Collins, Jerry and Kit Nowell, Randy Marcuson.